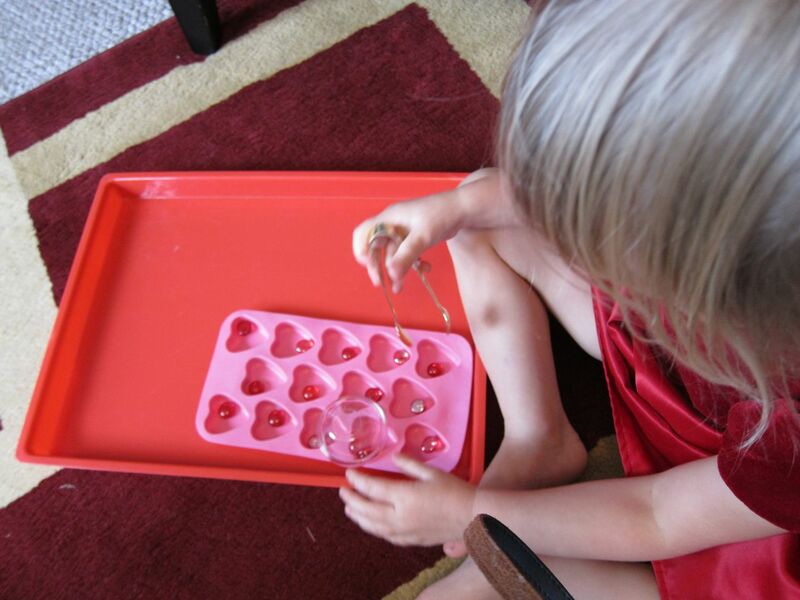 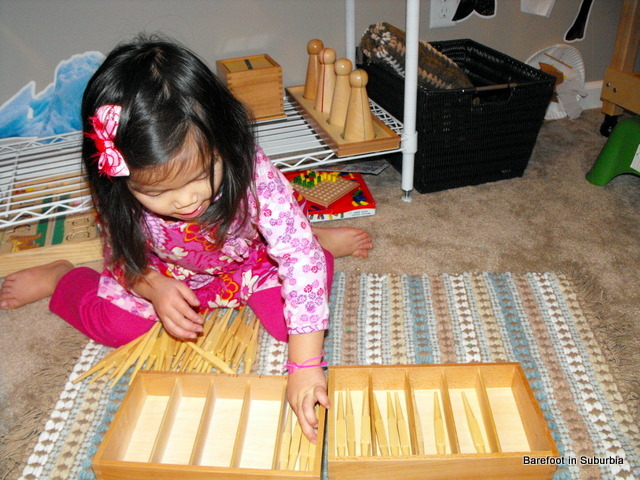 Here is the weekly review of Bug and Monkey’s week in the Montessori room! 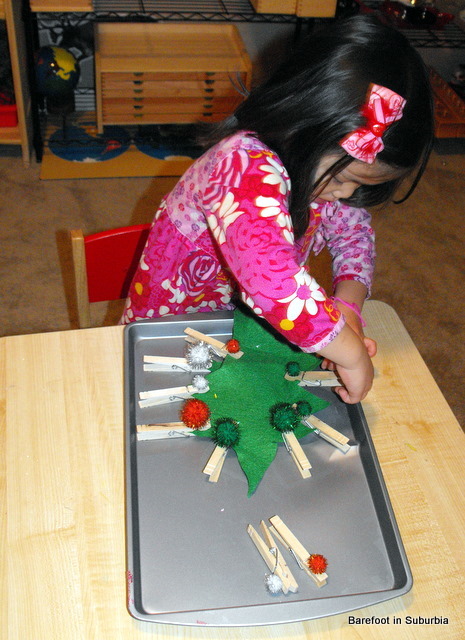 Monkey working on a sewing activity. 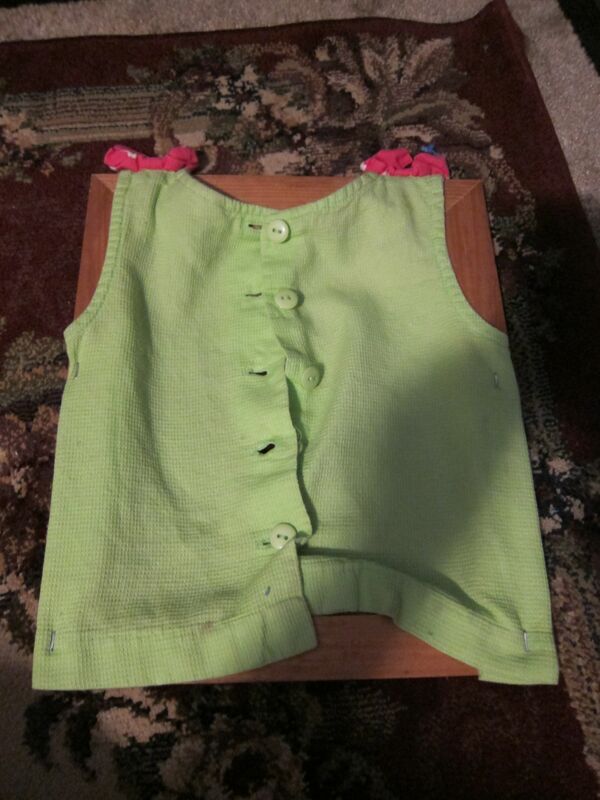 She had to "sew" the clothes onto the teddy bear by lacing the shoelace through the holes. 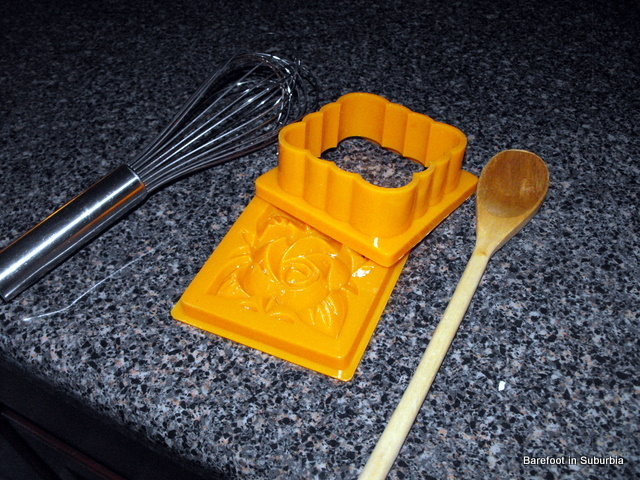 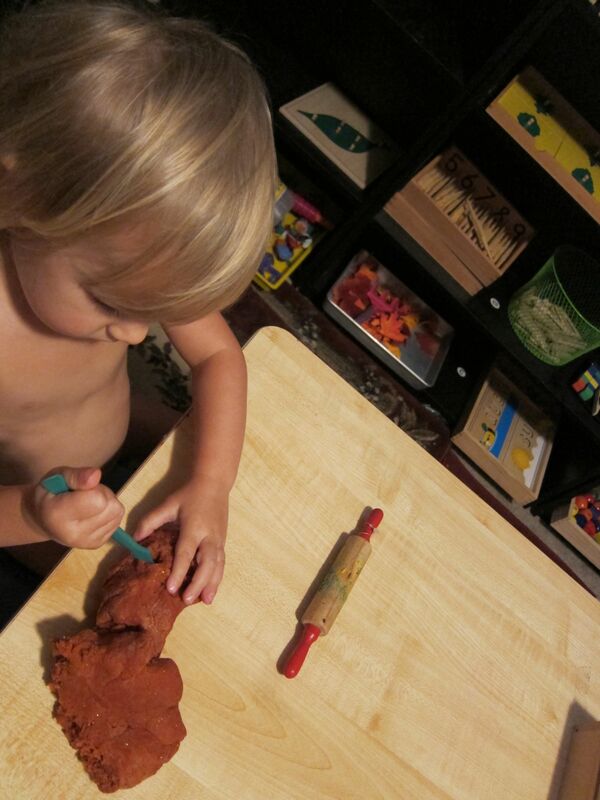 I put out some fall themed play dough this week--this one is dark orange with gold glitter and cinnamon in it. 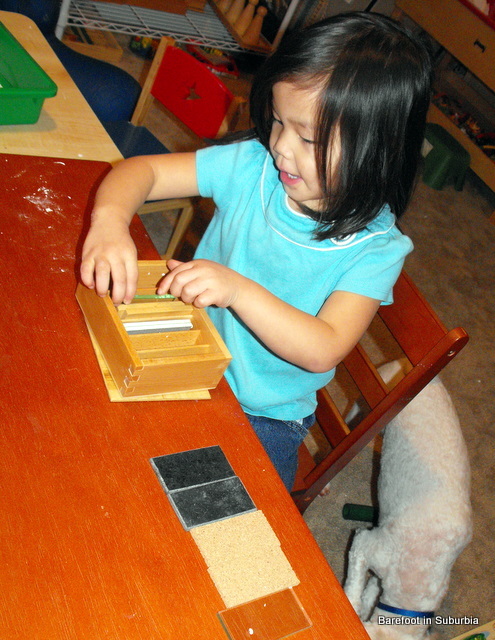 Monkey received her official diagnosis of Autism Spectrum Disorder (with an addition learning disability). 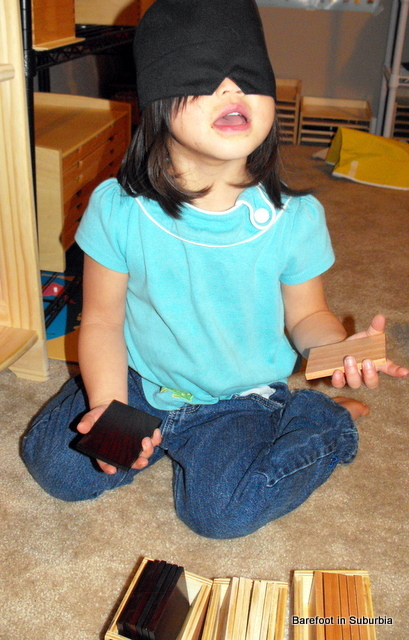 As part of her autism, she has a very difficult time with naming emotions, and with emotional regulation. 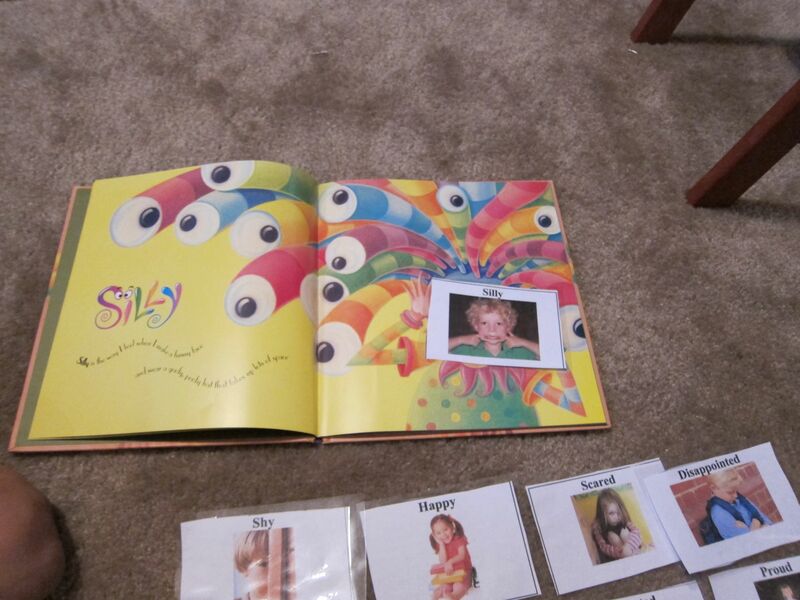 This week, I developed this work to help her learn the names for the emotions. 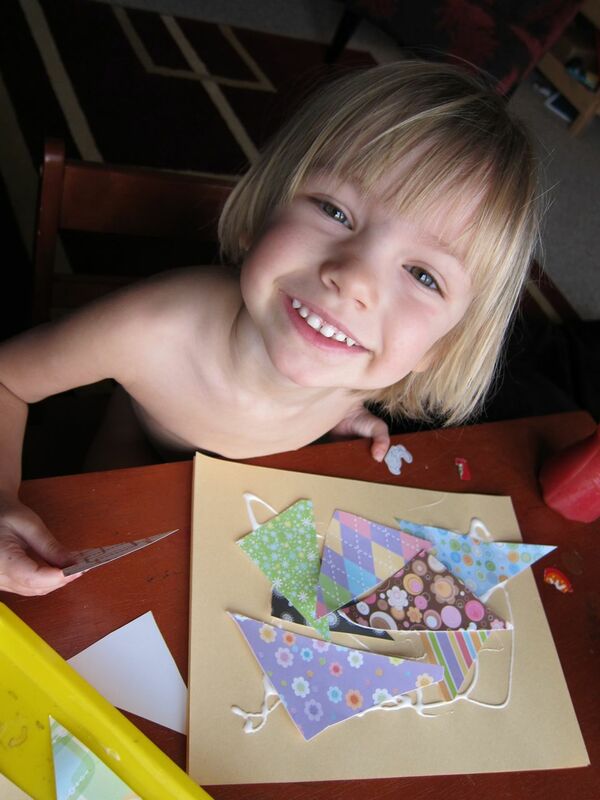 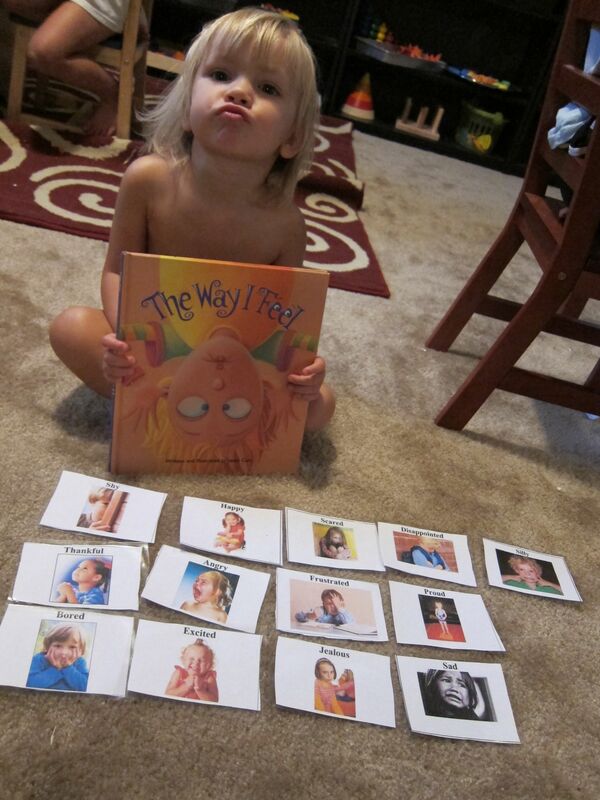 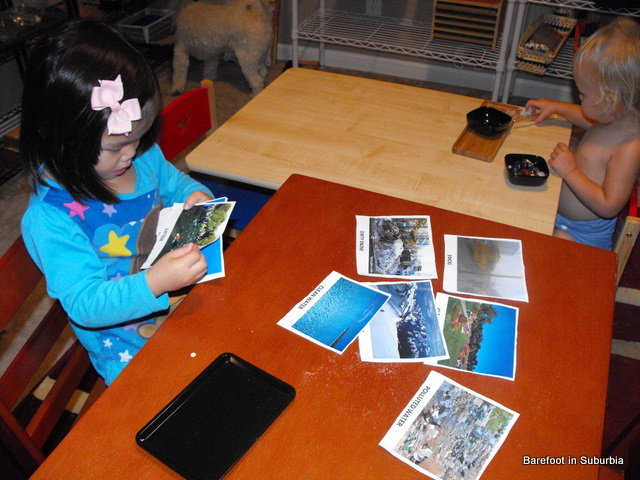 I took the book "The Way I Feel" and created cards of all the feelings using pictures of real children. 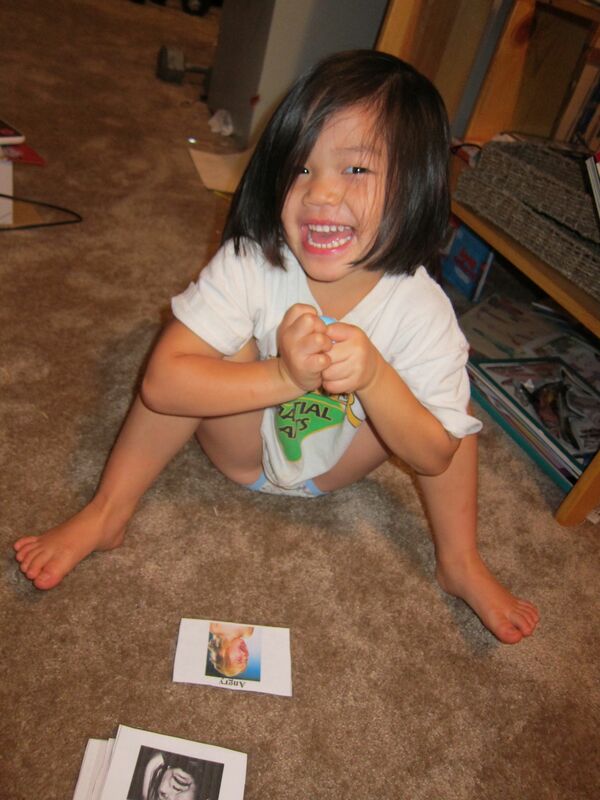 Then Monkey matches the card with the page while we read the book. 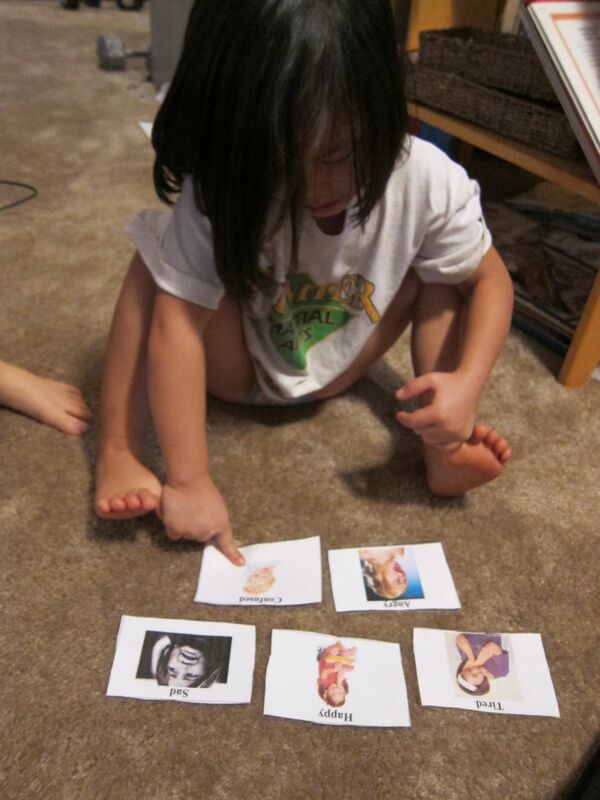 I also made a second set of cards with those emotions that Monkey generally has difficulty with in her own life. 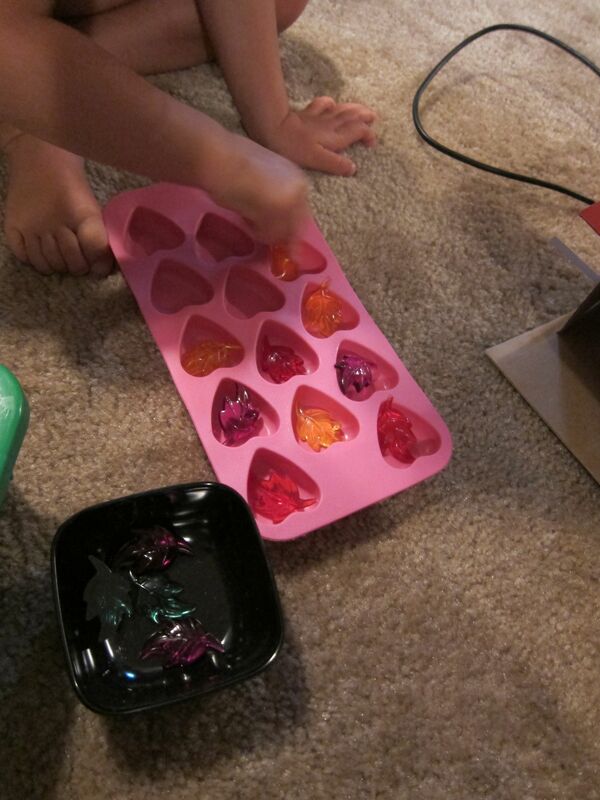 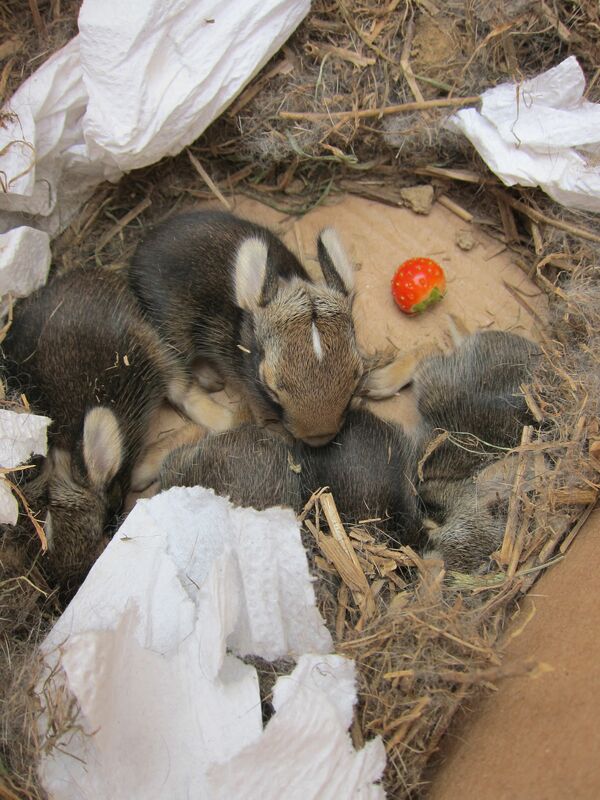 These are kept in a basket on the main level of the house so she can choose a card to describe her feelings. 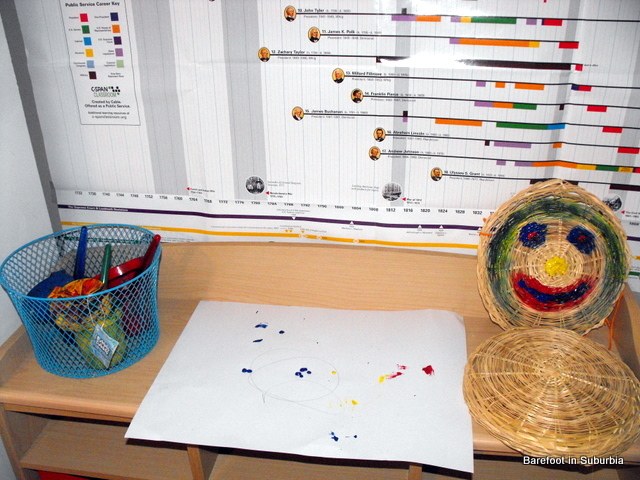 Monkey has a big problem with aggression and rages, so I also pulled out one of Jedi's old tubs of theraputty and put it in the feelings basket. 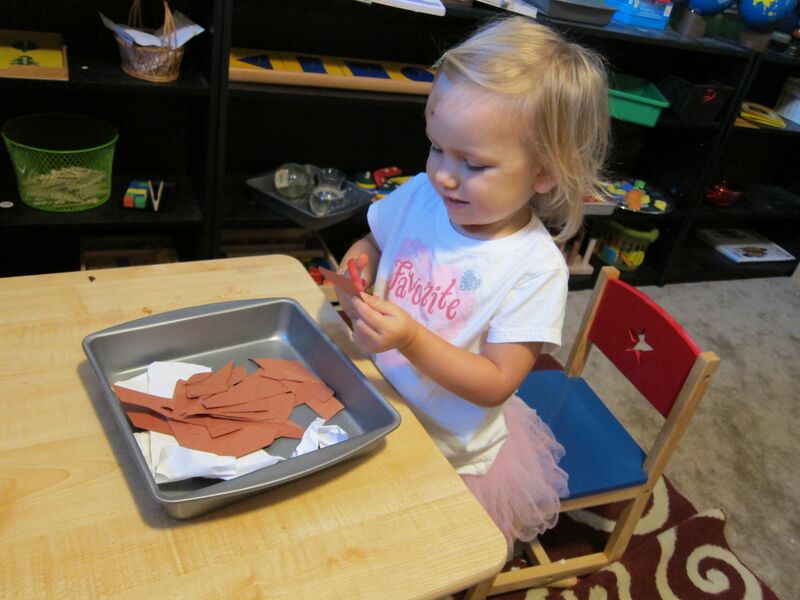 When Monkey is feeling very angry, she can go to the basket, pull out the "angry" card and the putty (which she calls "angry putty" ) and work with the putty to help her calm down. 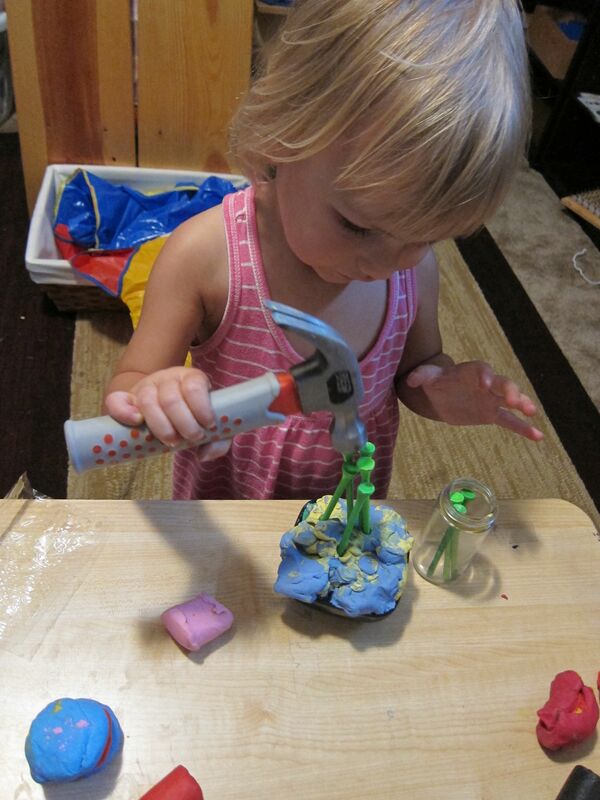 It's a very firm putty, and stretching/pulling/twisting/hitting it seems to help her calm down. 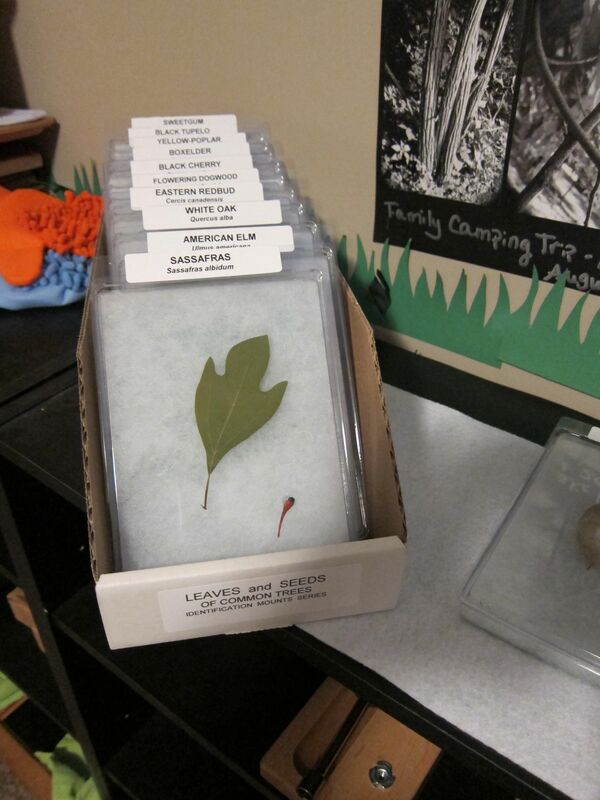 The "Please Touch" table for the next couple weeks--various samples of leaves with their seeds. 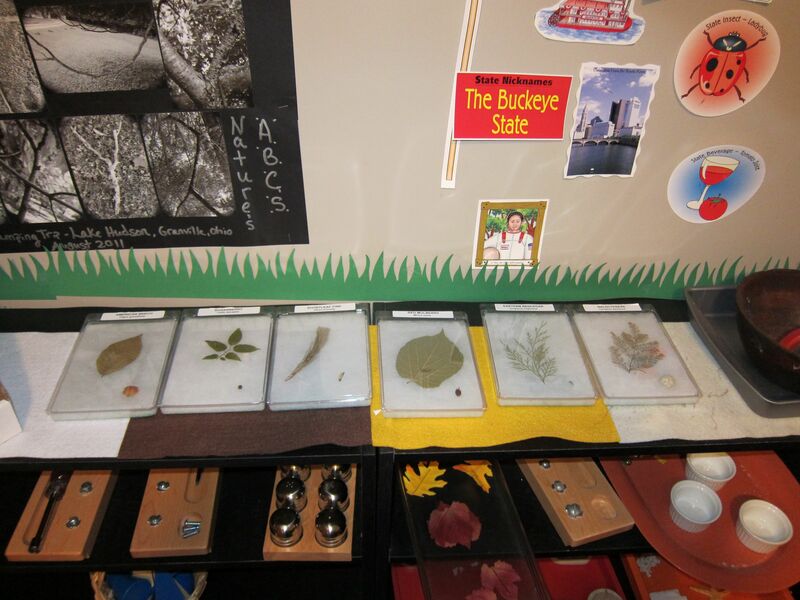 Some more of the leaves and seeds. 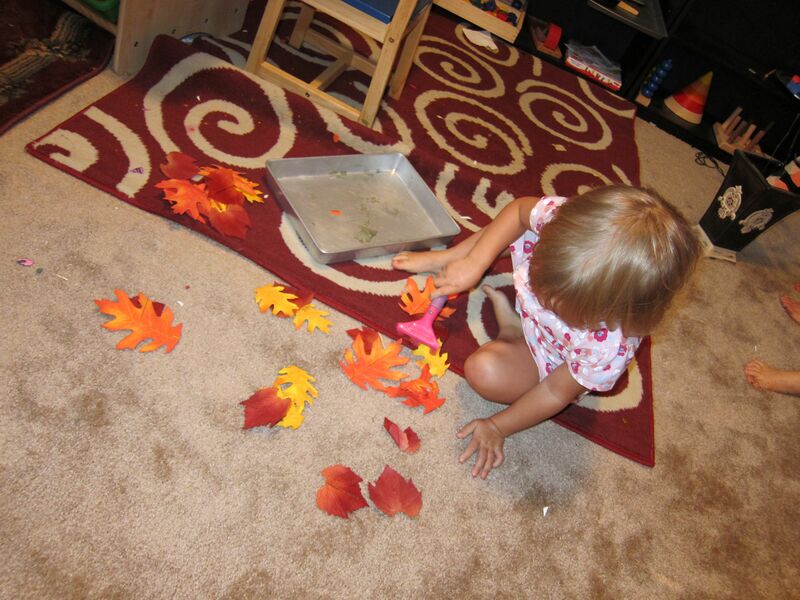 Creating fall leaves out of coffee filters. 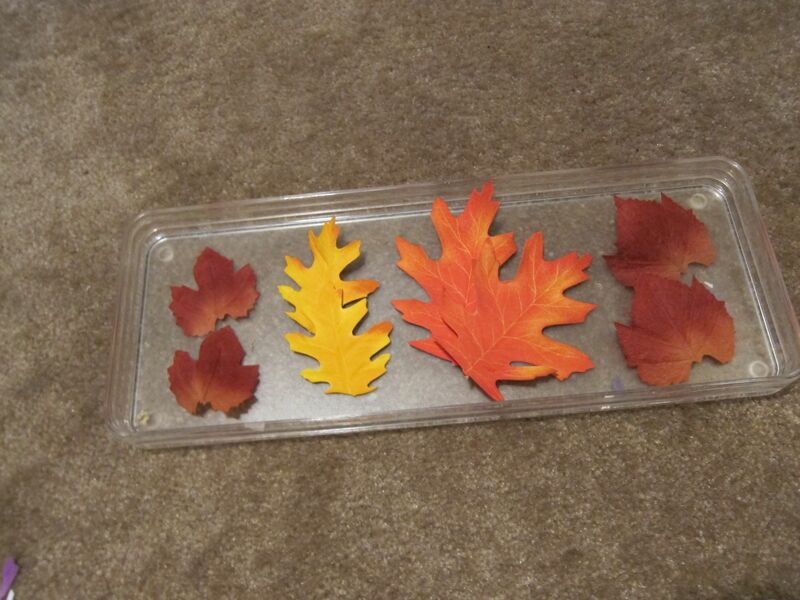 I cut small leaf shapes out of coffee filters. 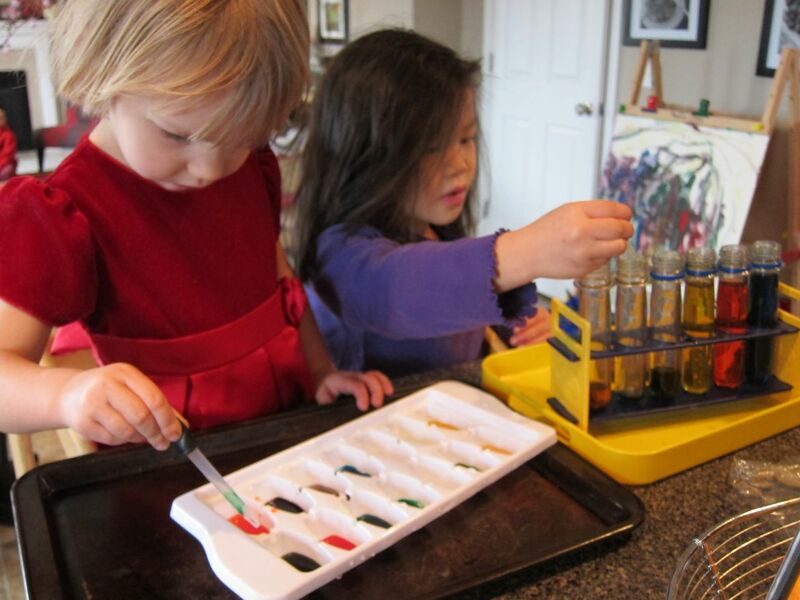 Then I gave Bug & Monkey little jars of water & food coloring (one jar has yellow and one jar has orange), and some eye droppers. 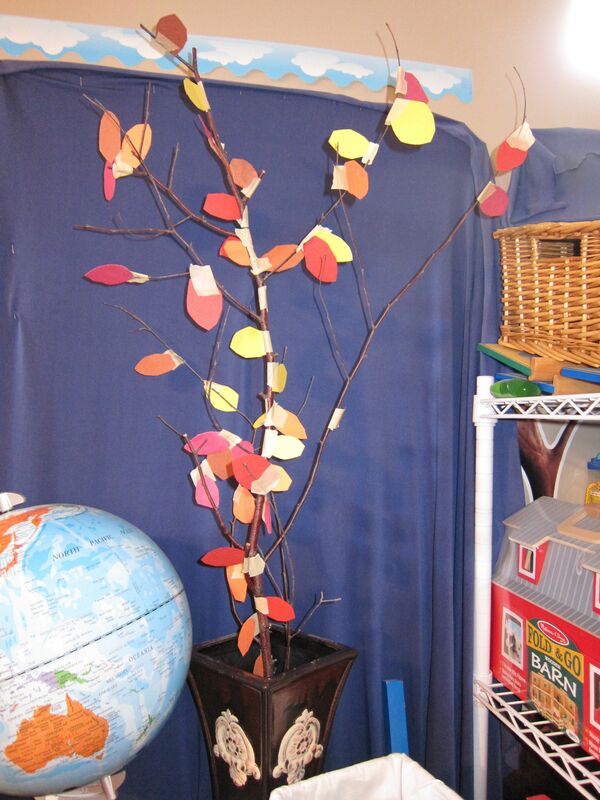 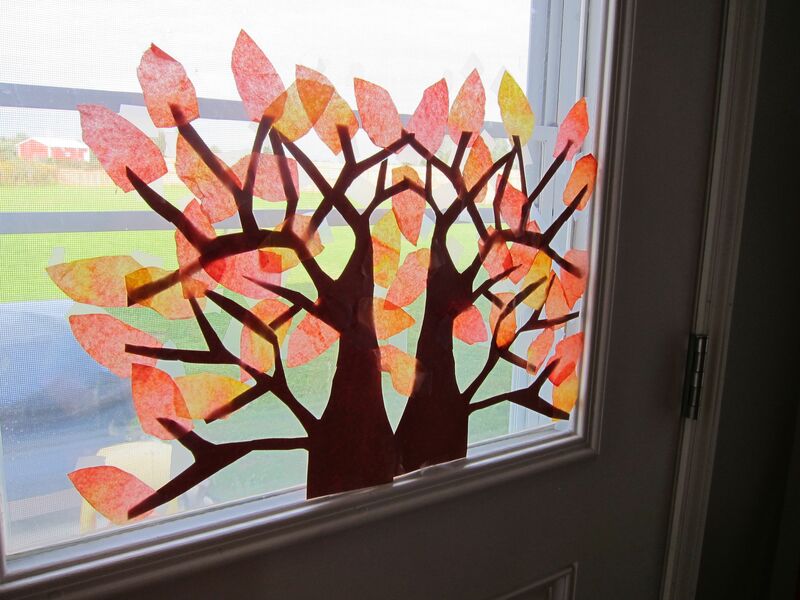 After the leaves were dry, I taped them to some construction paper branches and hung it on our back door. 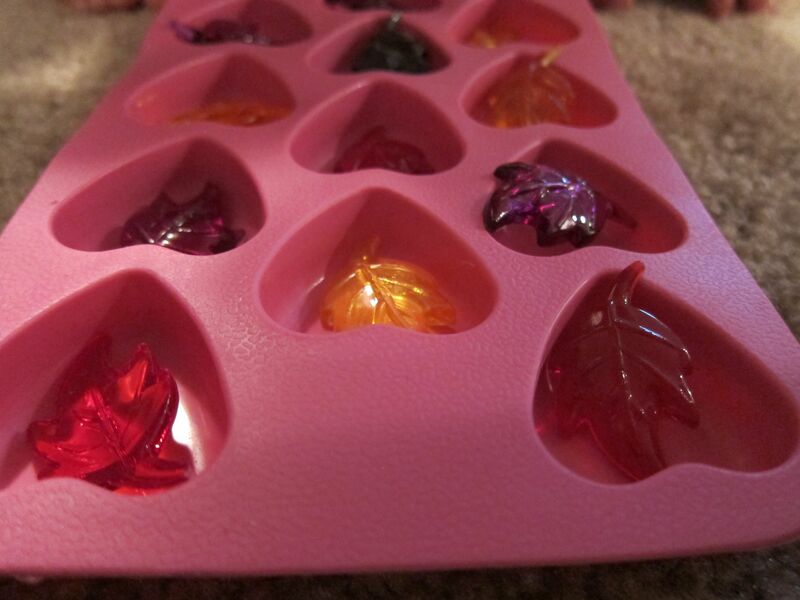 I love how the sun shines through it! 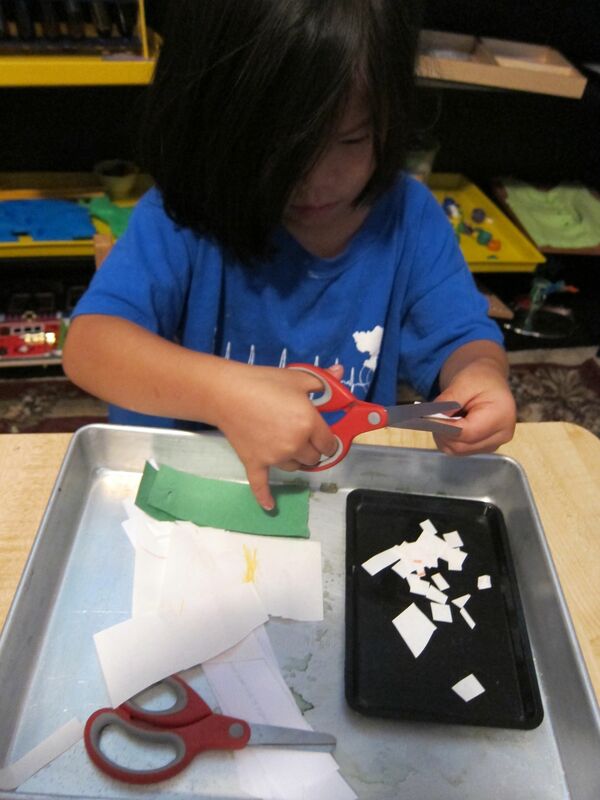 Bug doing her new favorite thing...snipping paper. 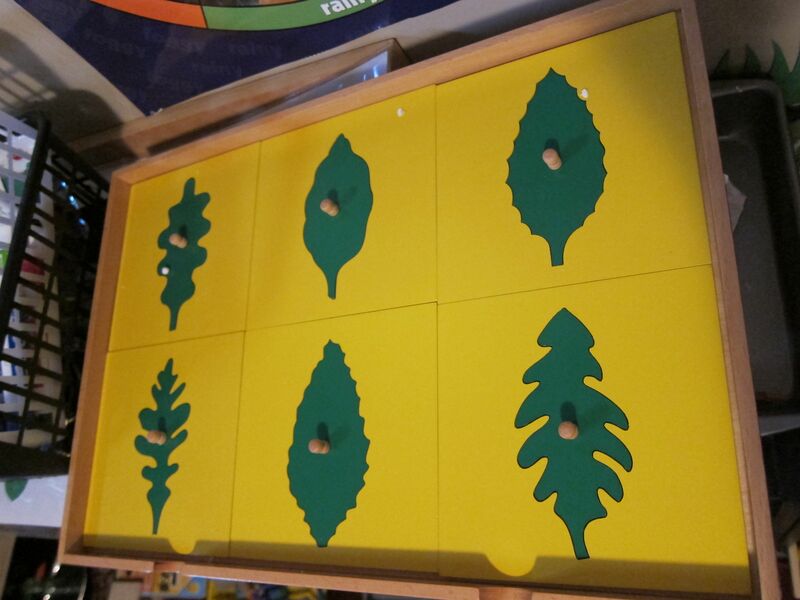 A sound matching work. 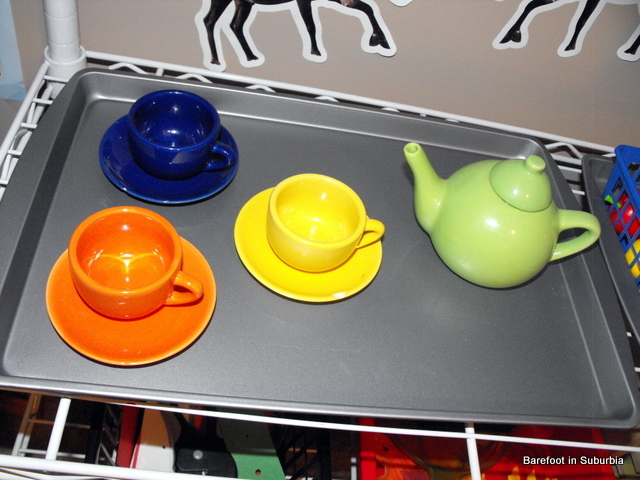 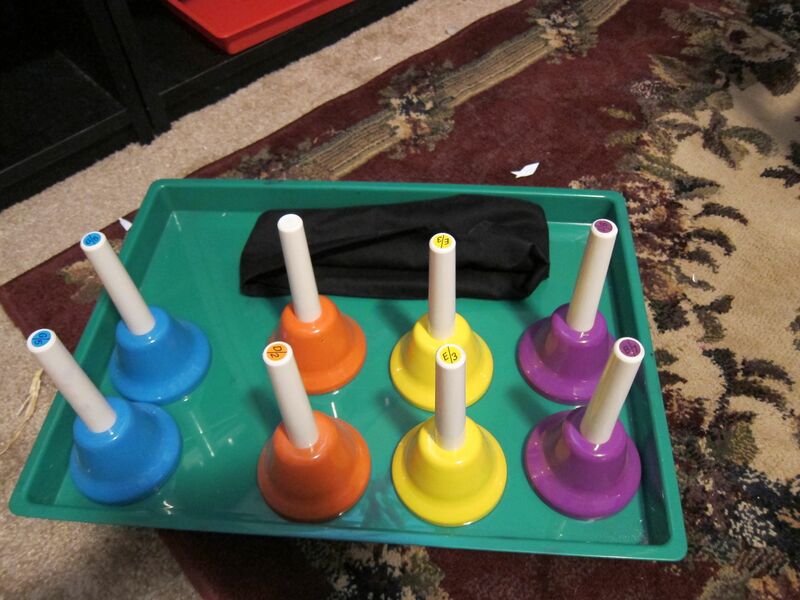 I put four pairs of bells from our handbell sets on a tray along with a blindfold. 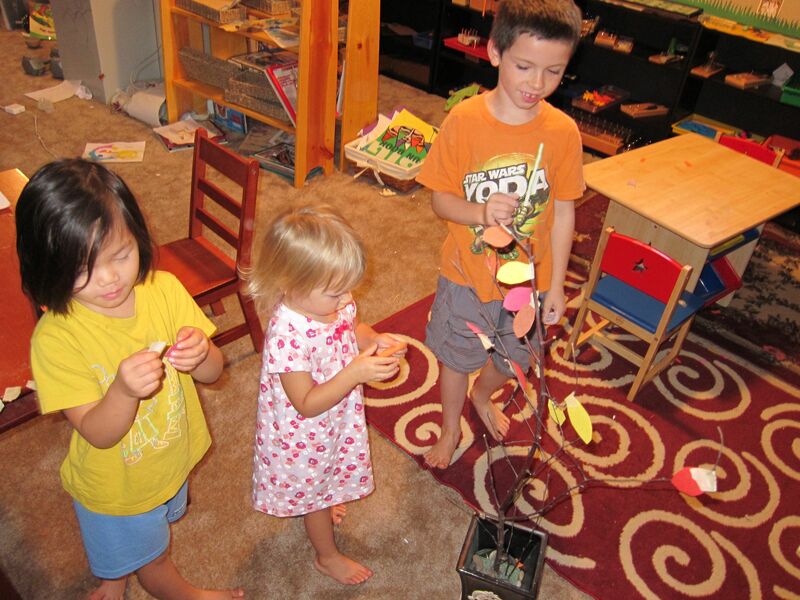 The kids then matched the bells by sound. 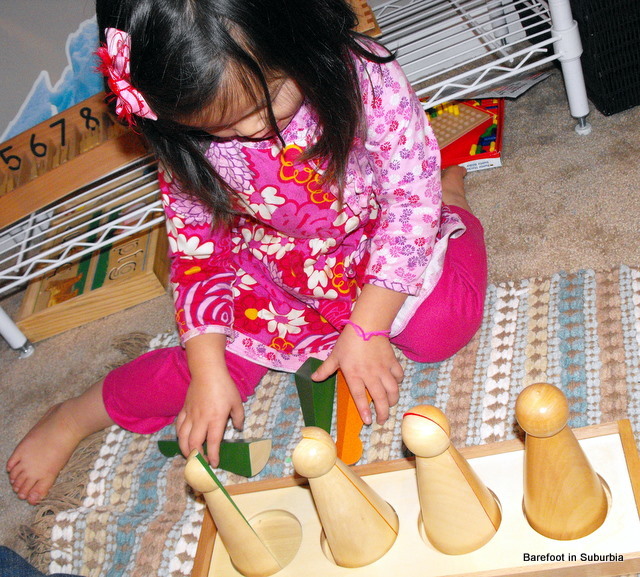 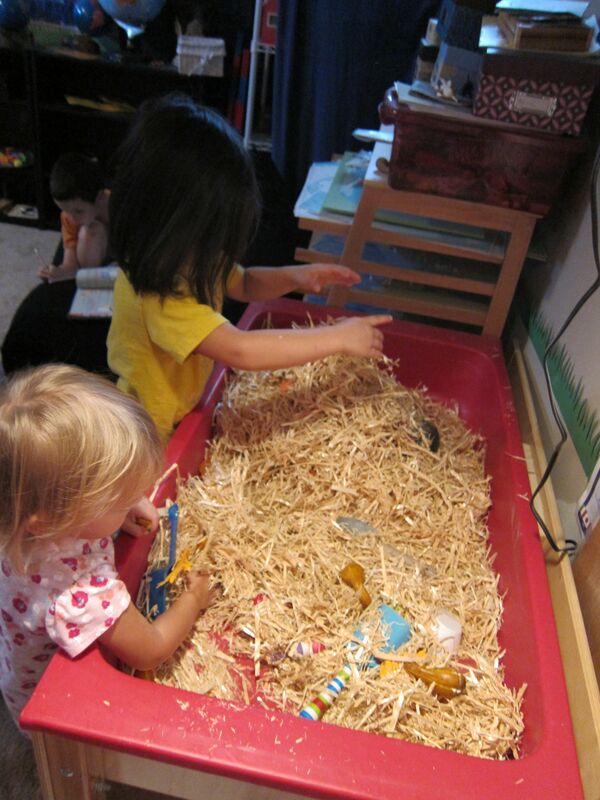 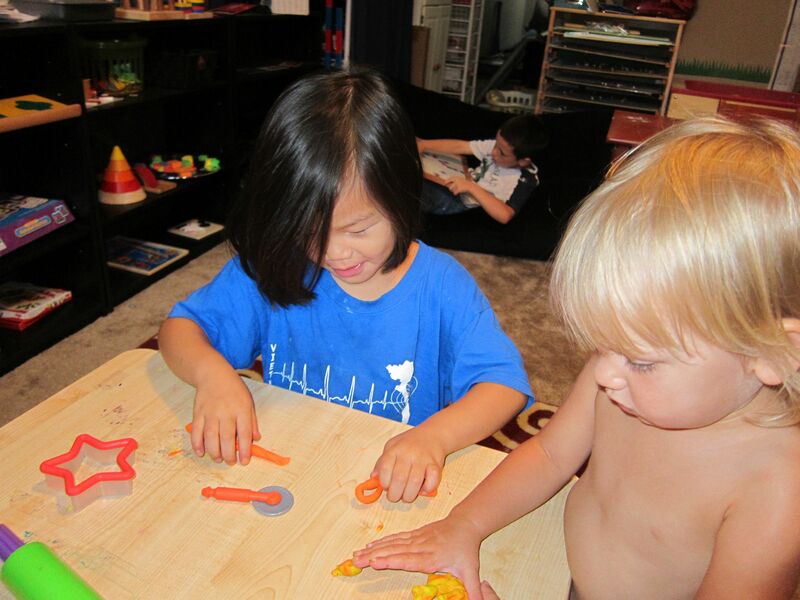 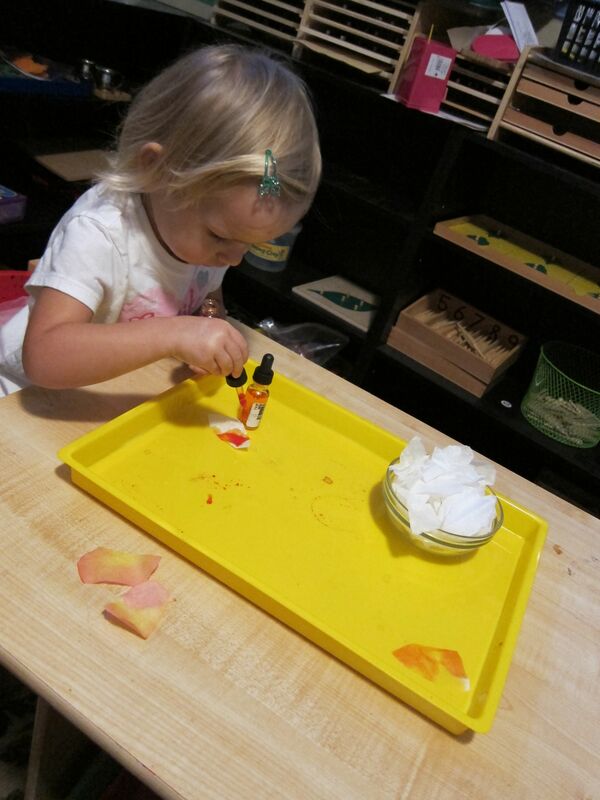 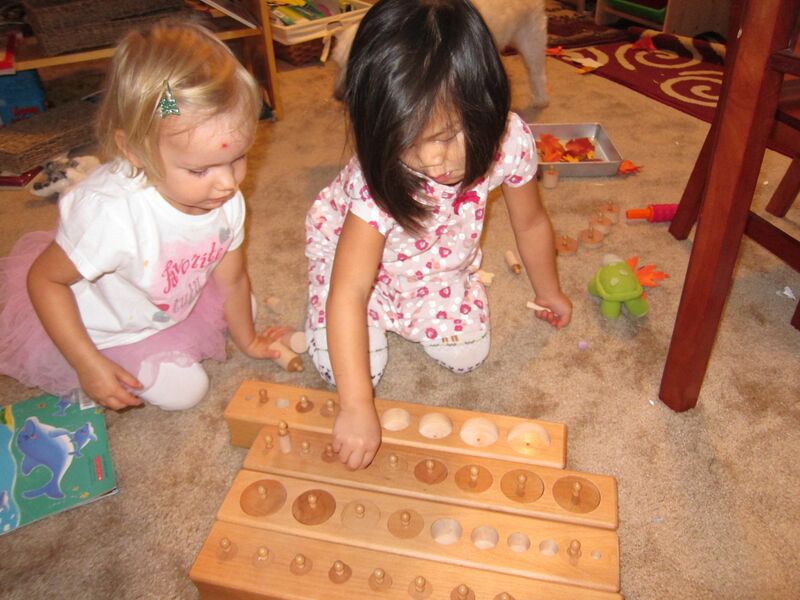 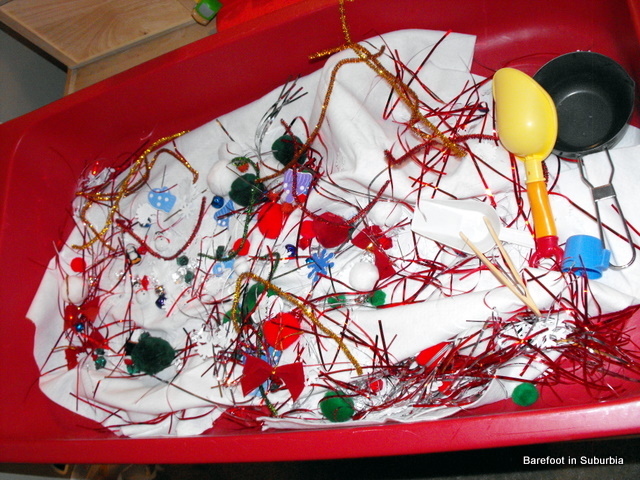 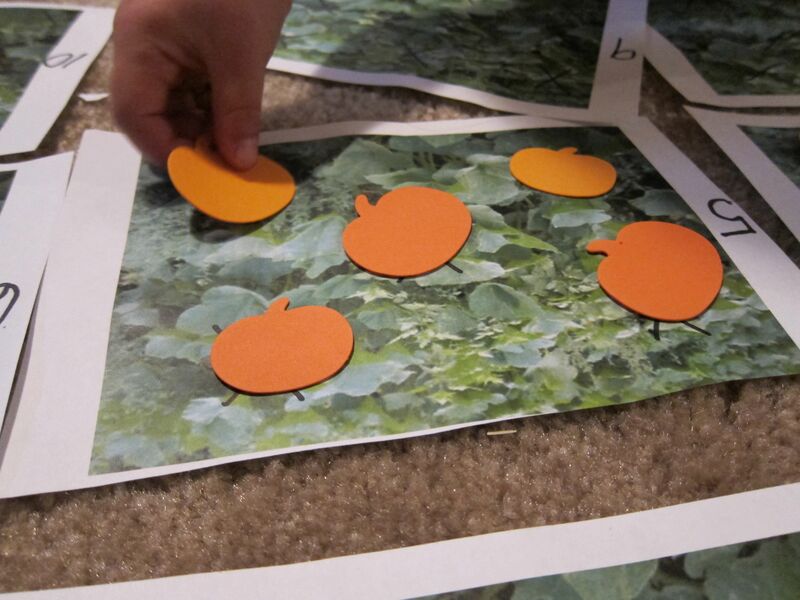 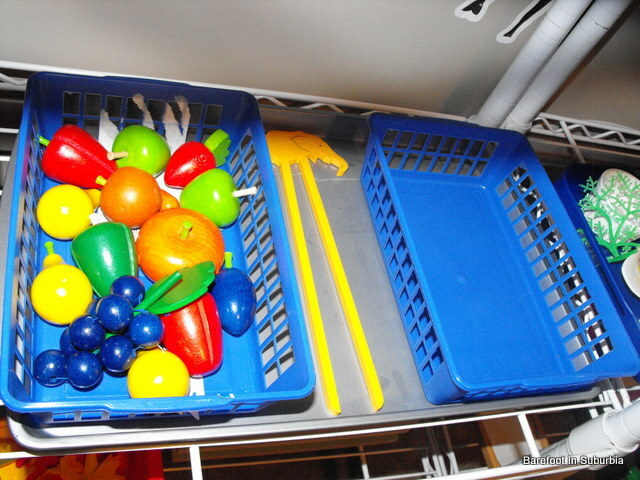 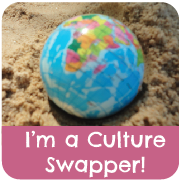 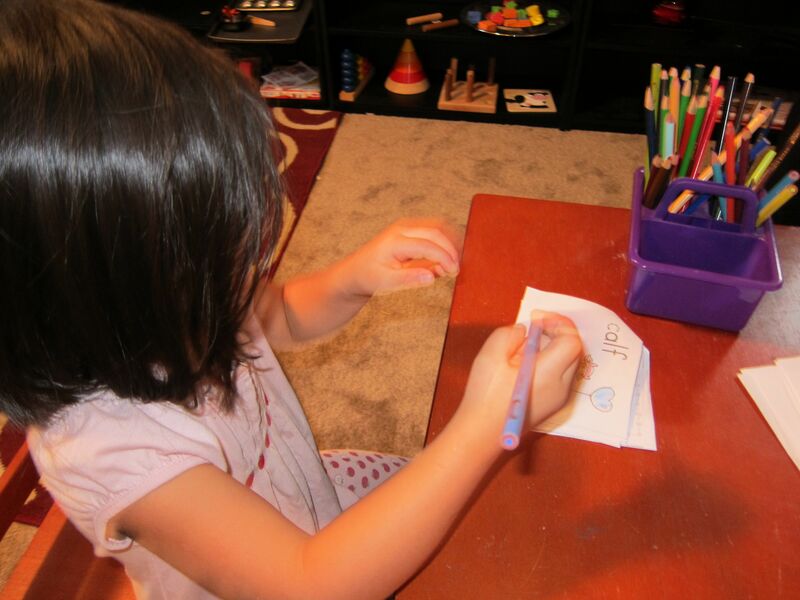 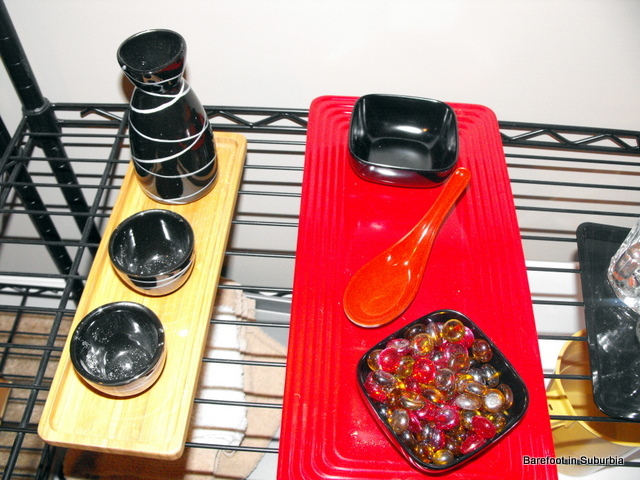 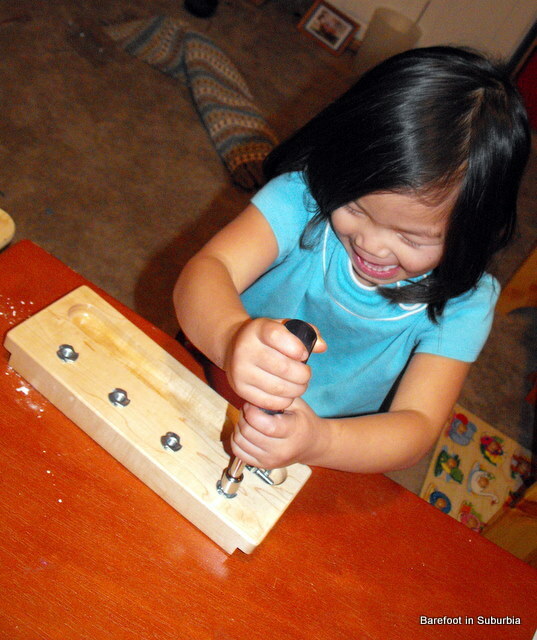 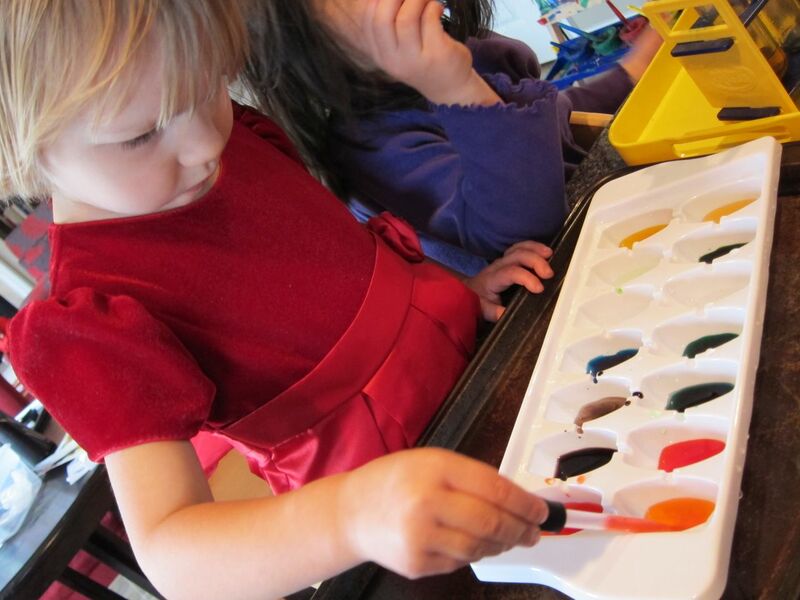 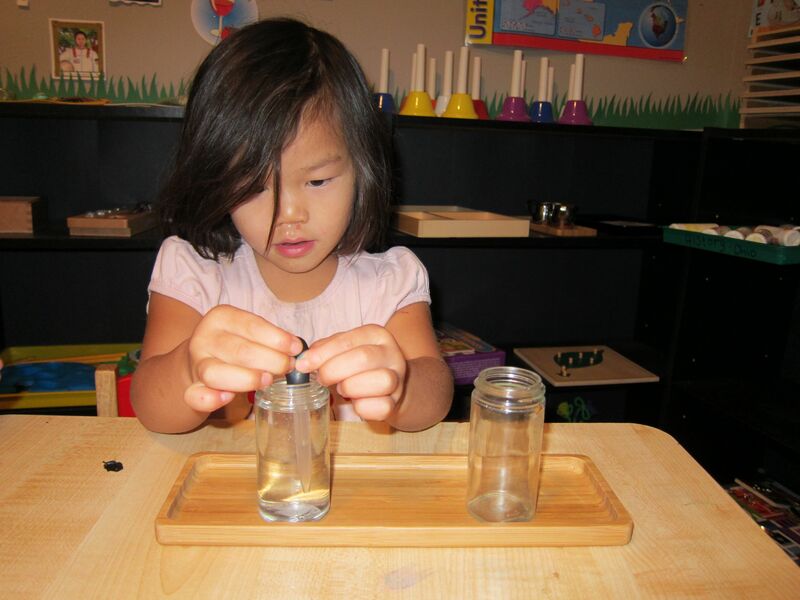 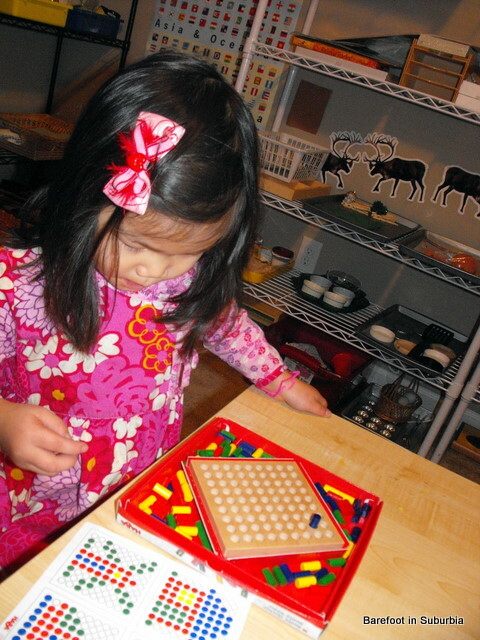 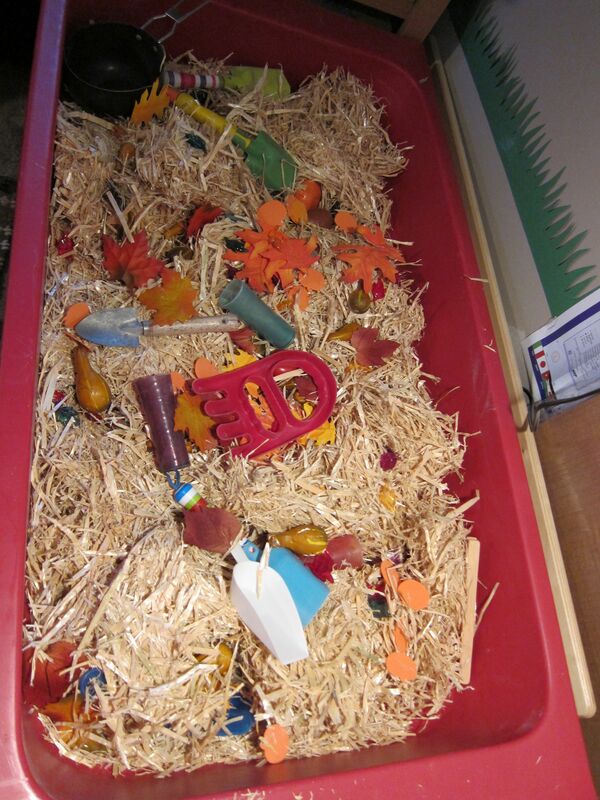 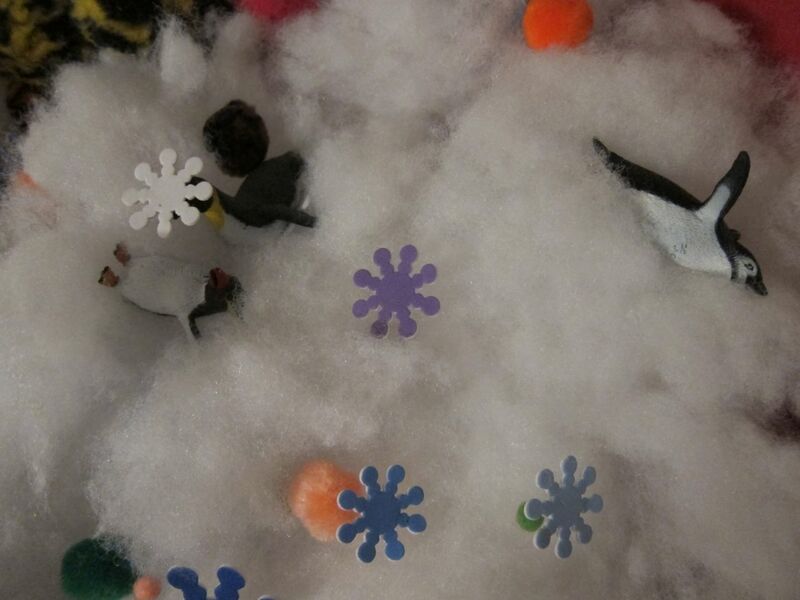 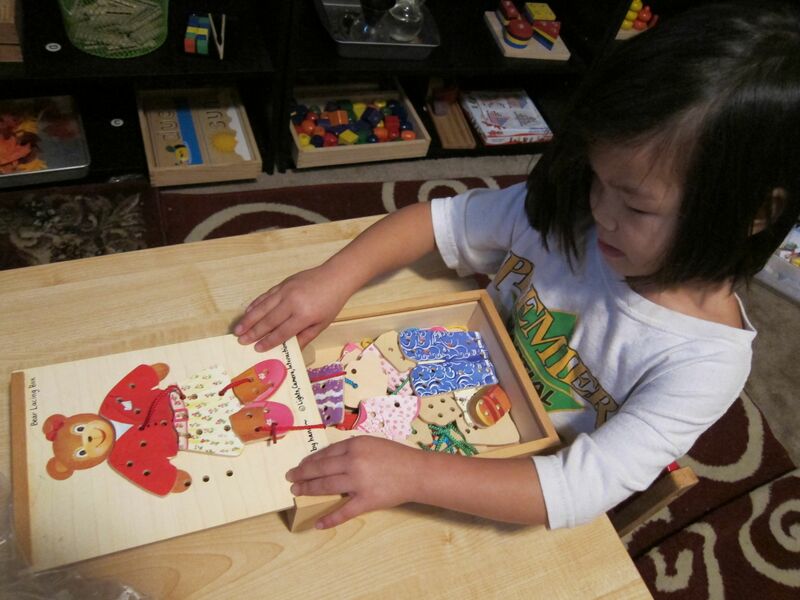 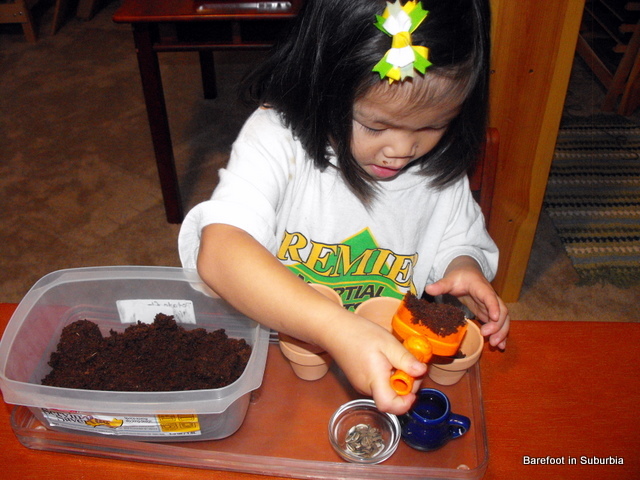 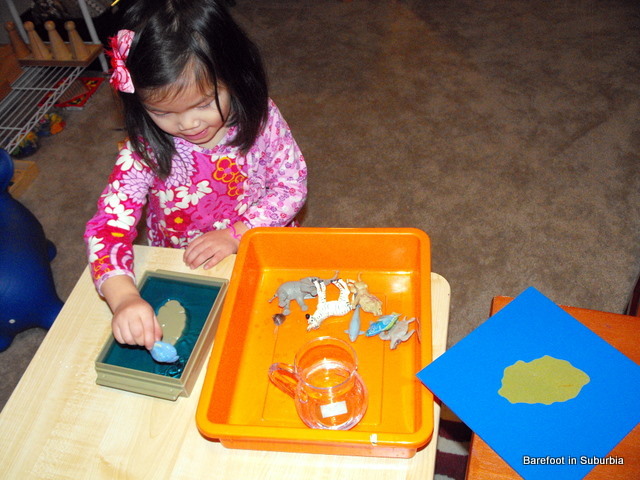 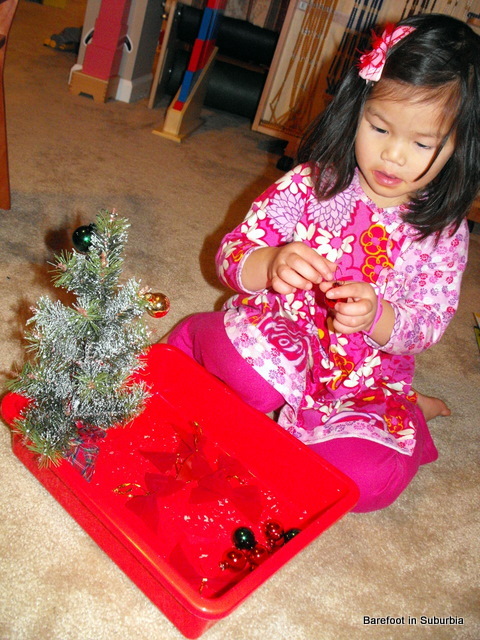 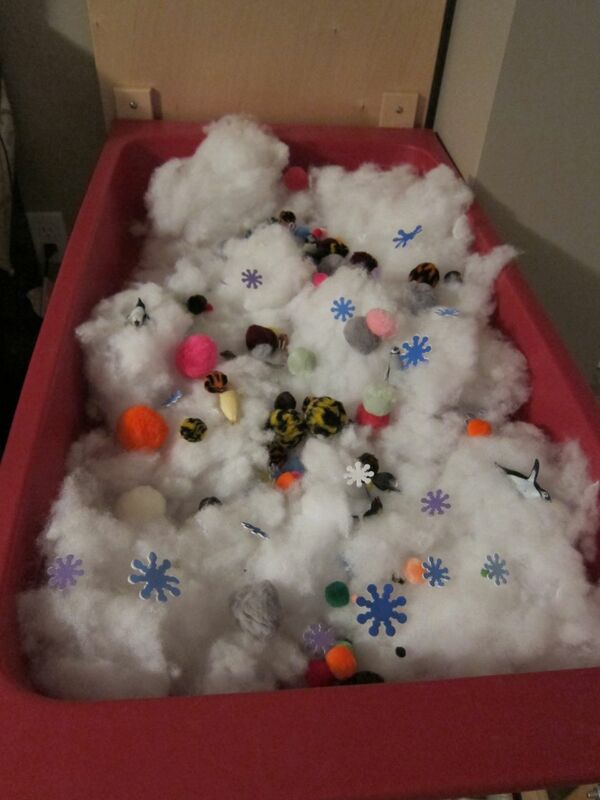 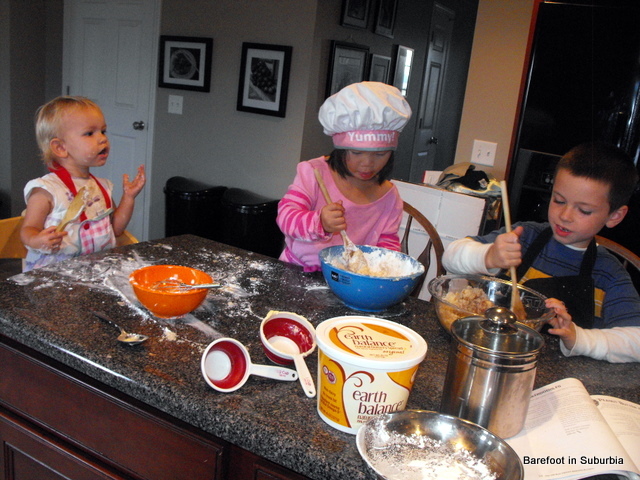 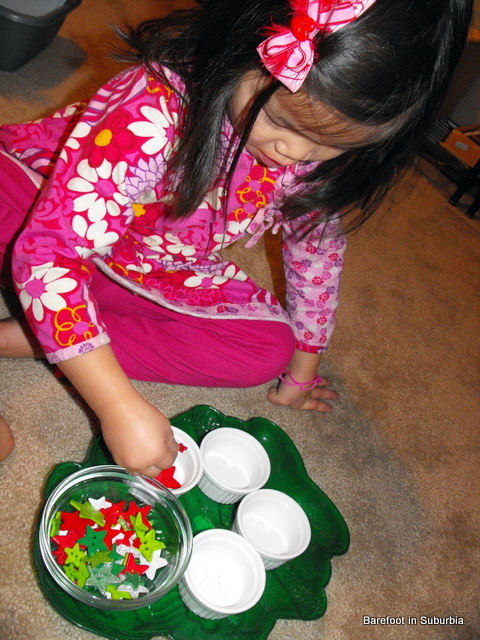 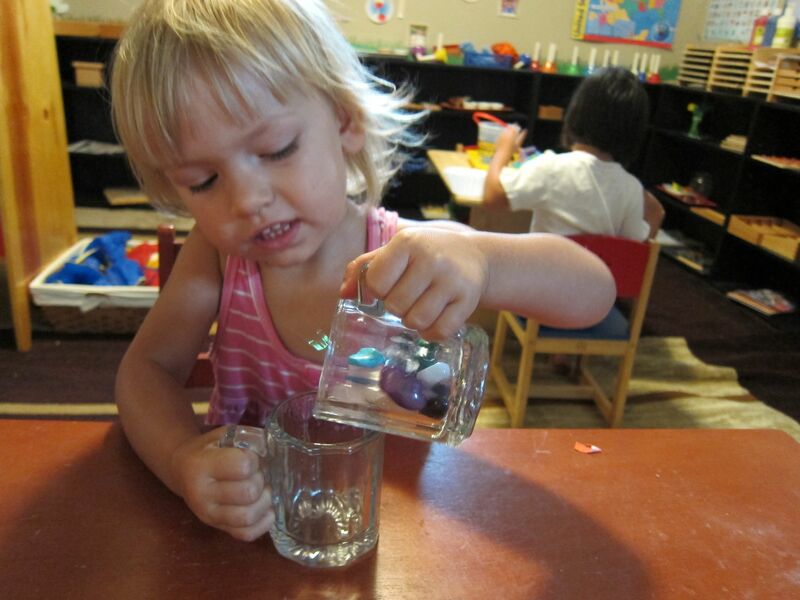 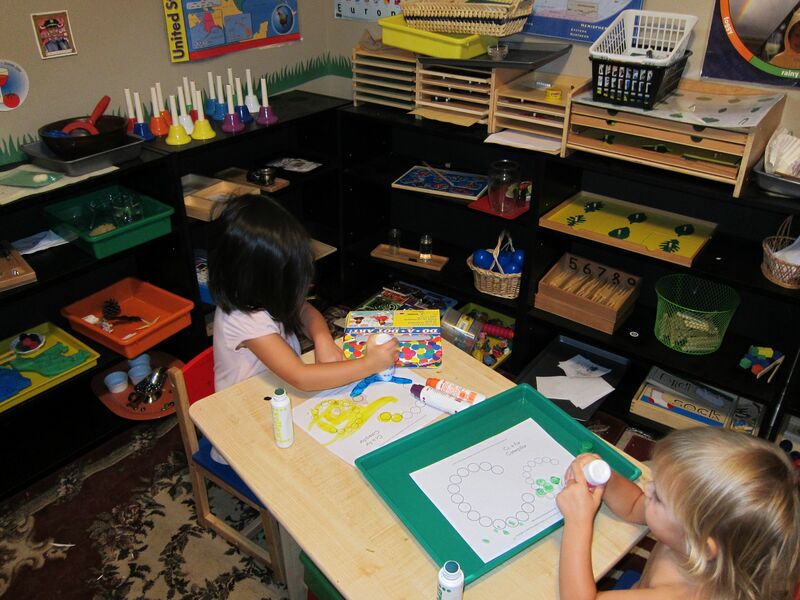 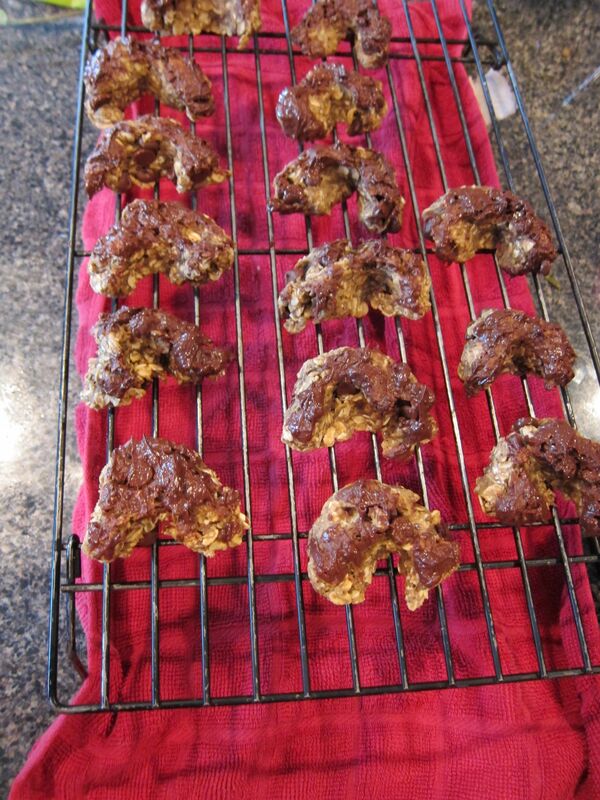 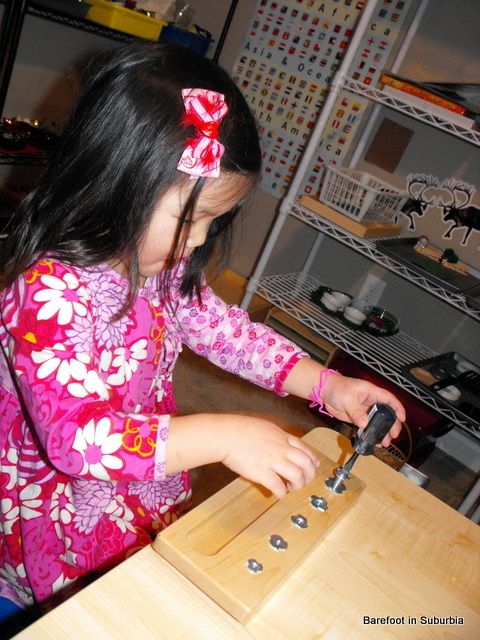 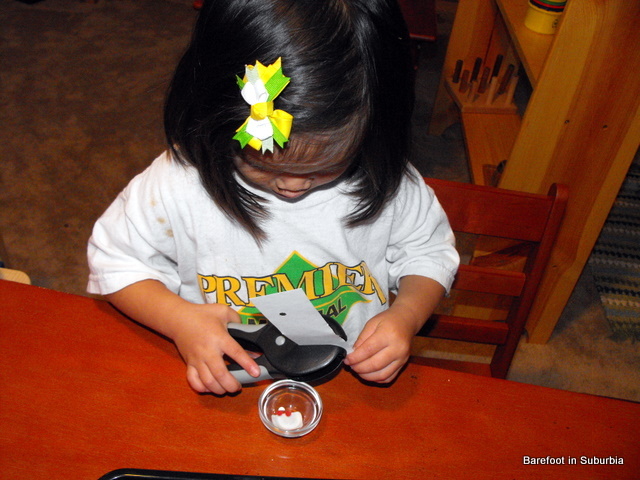 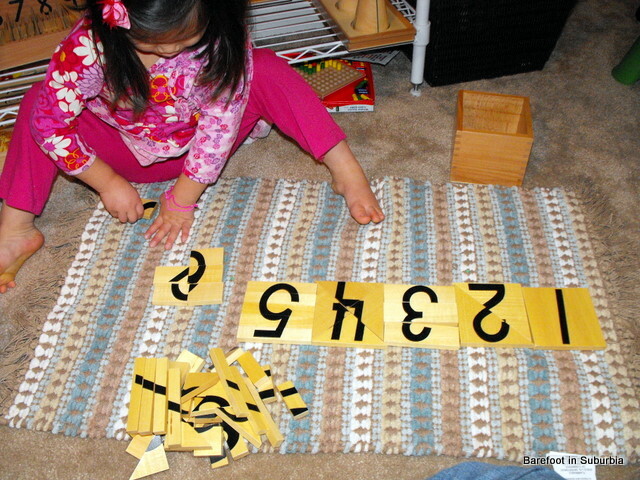 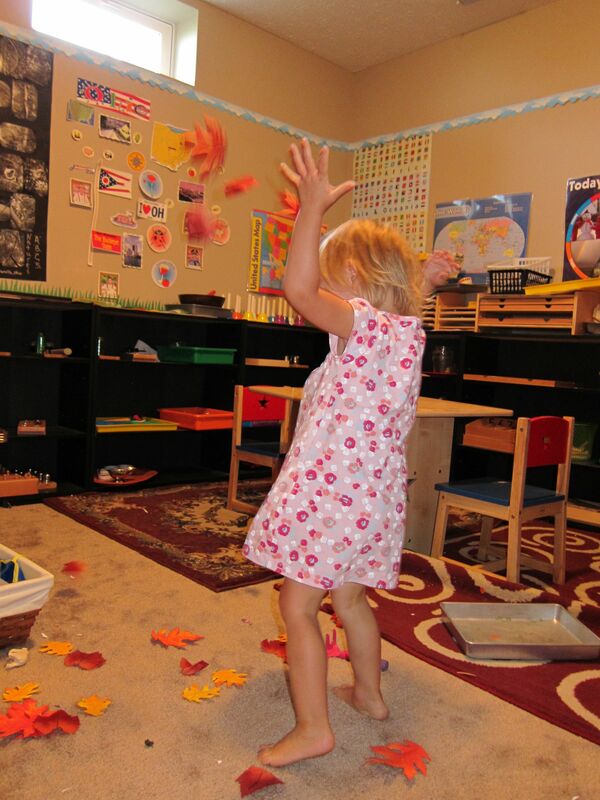 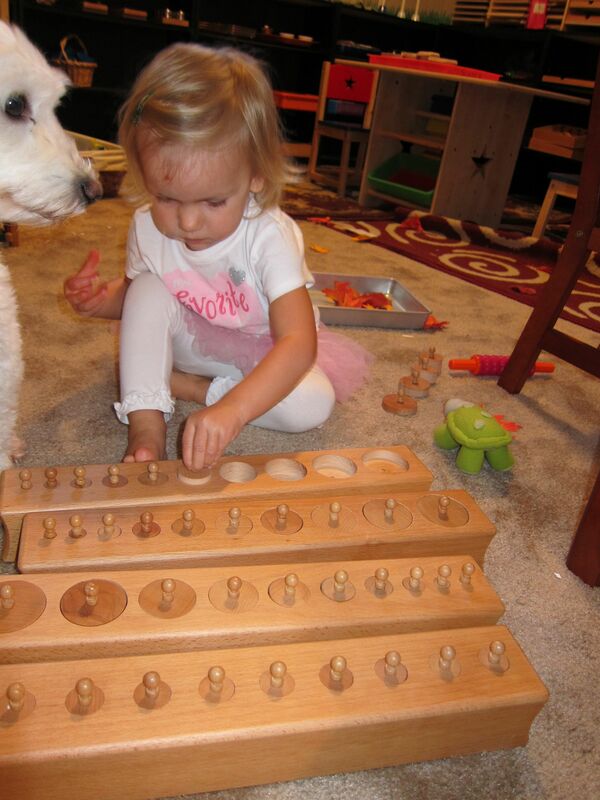 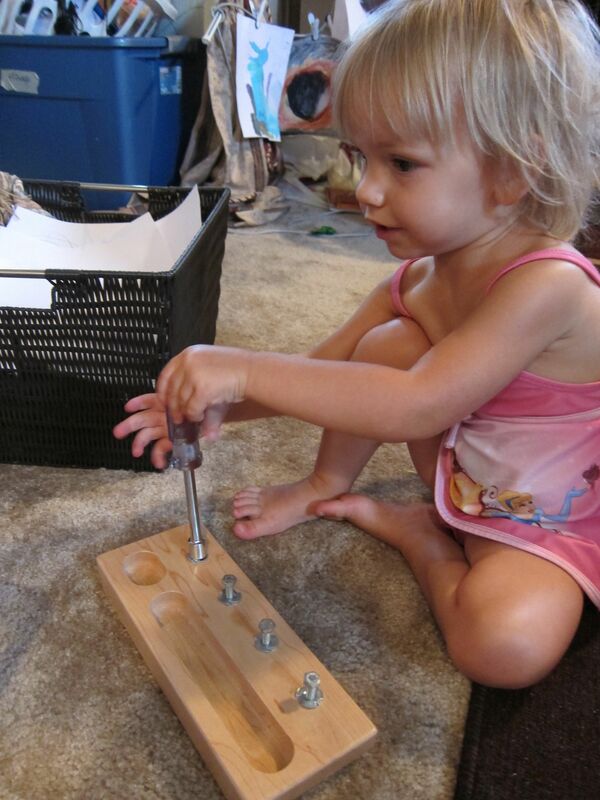 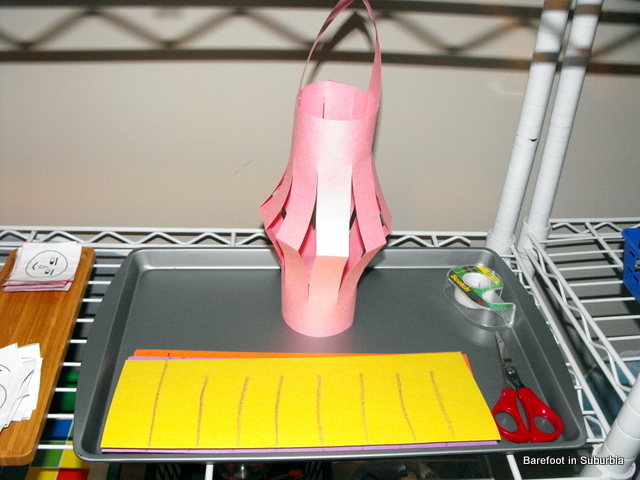 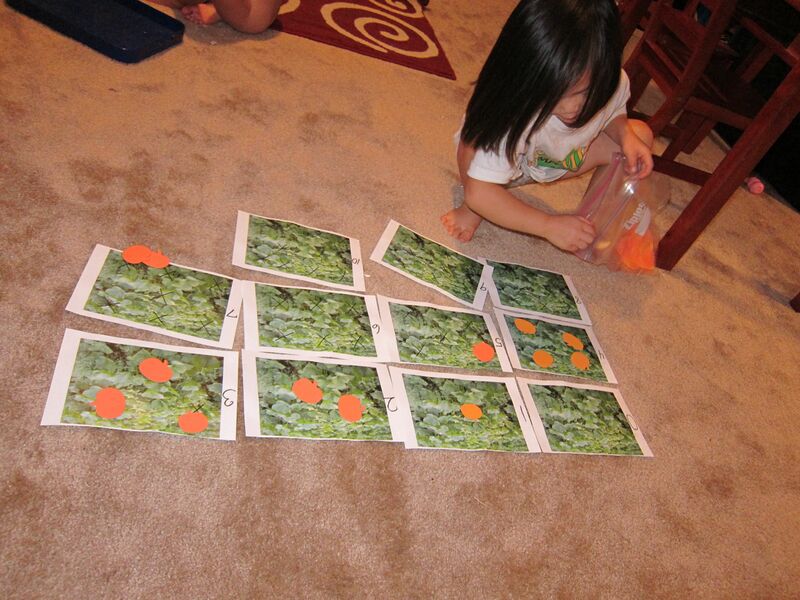 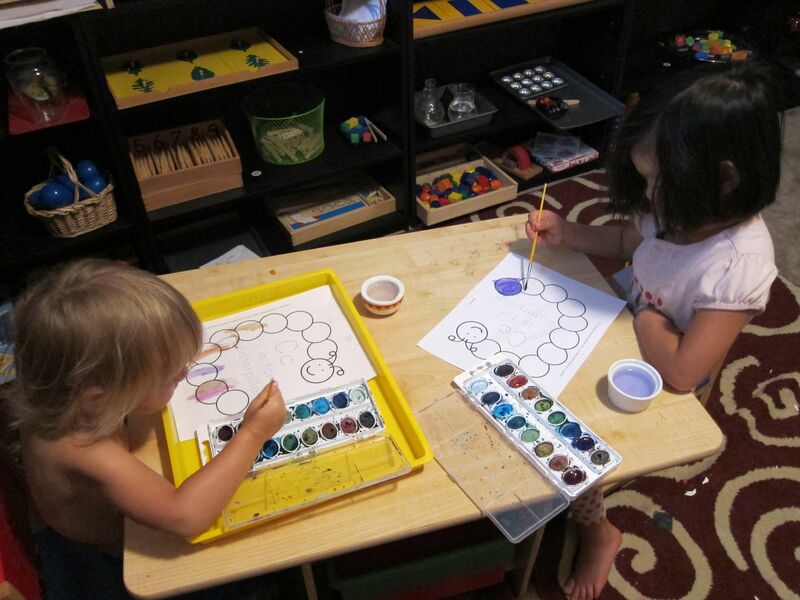 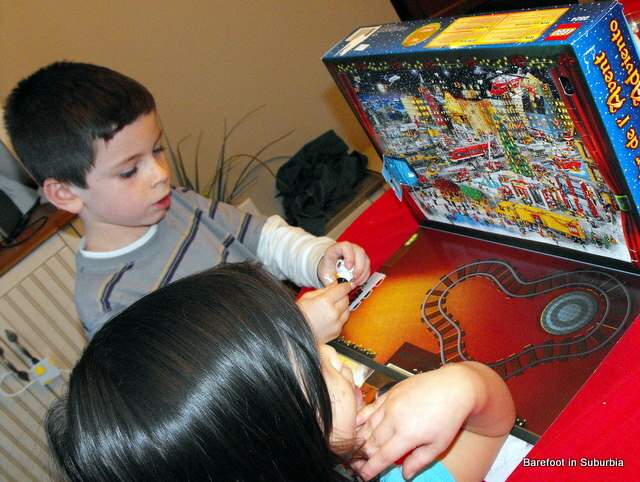 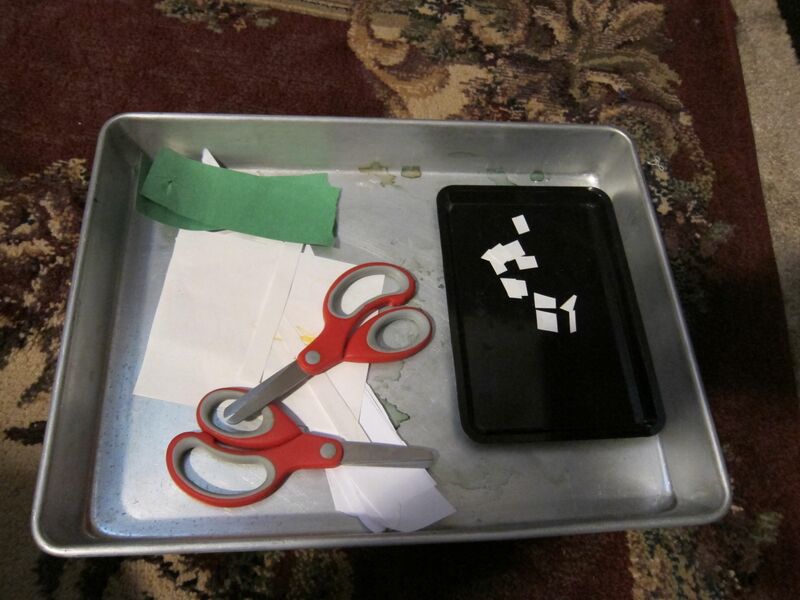 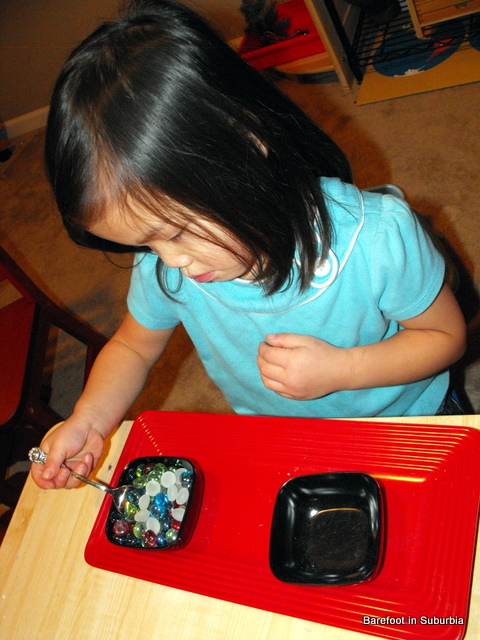 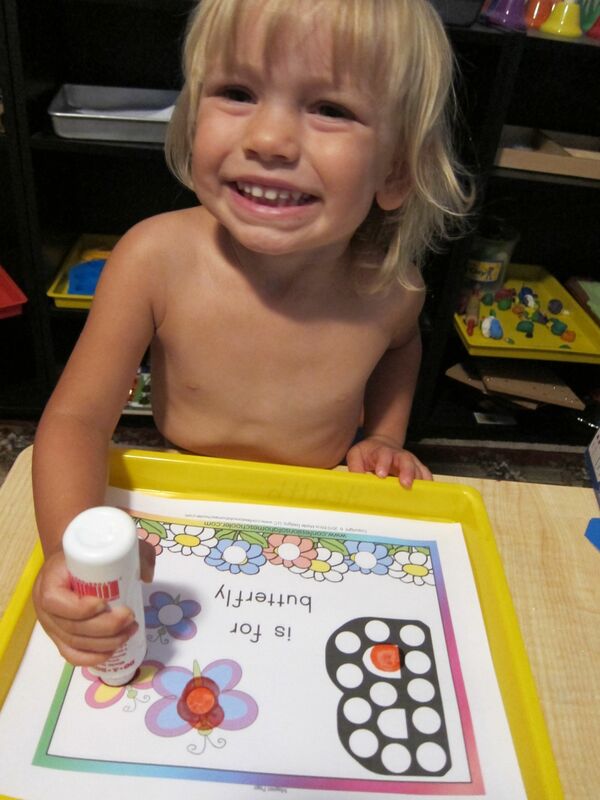 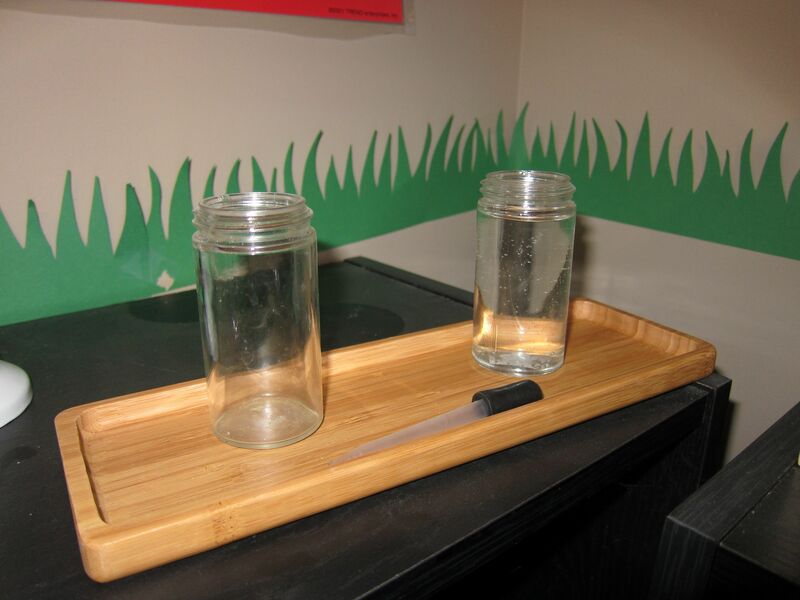 Here is the weekly review of the work Bug & Monkey did in the Montessori room. 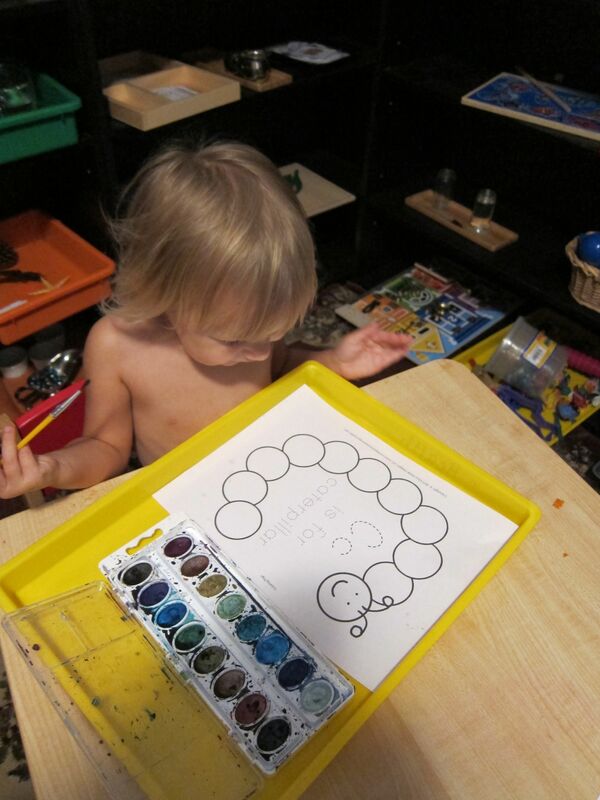 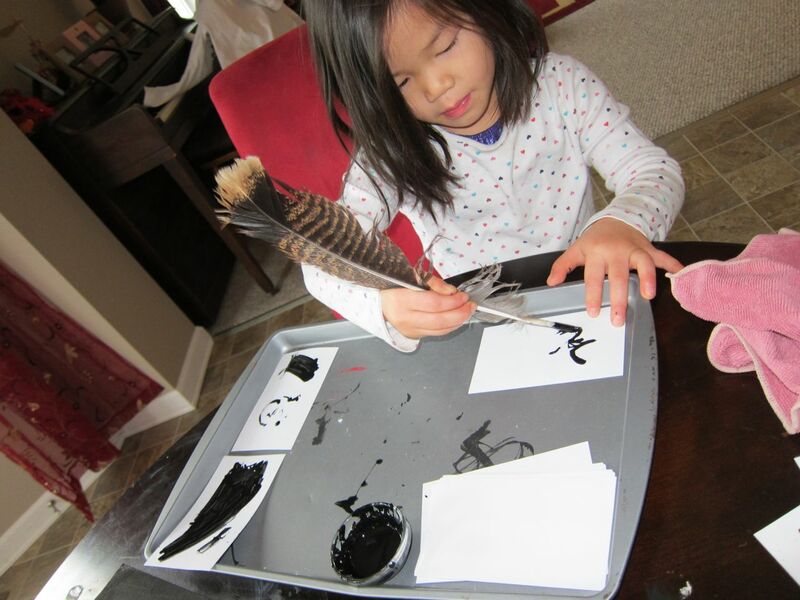 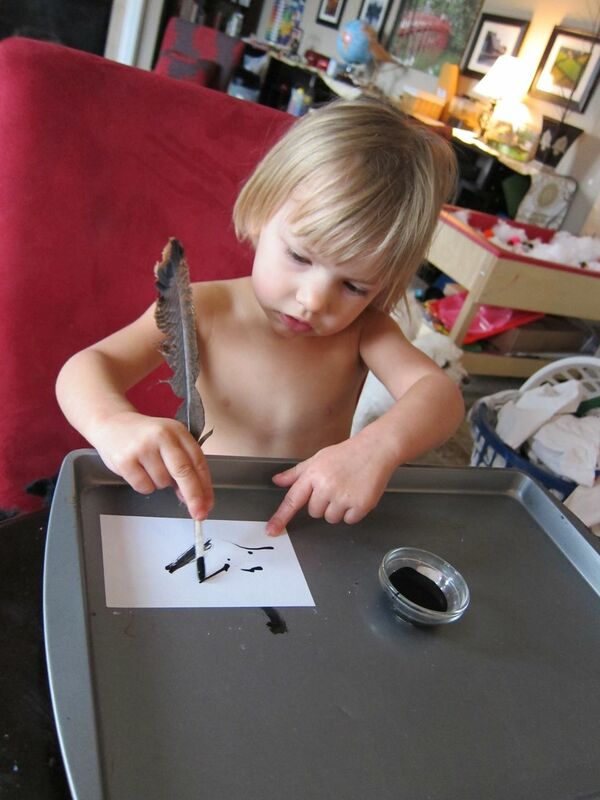 Monkey painting her dinosaur poster. 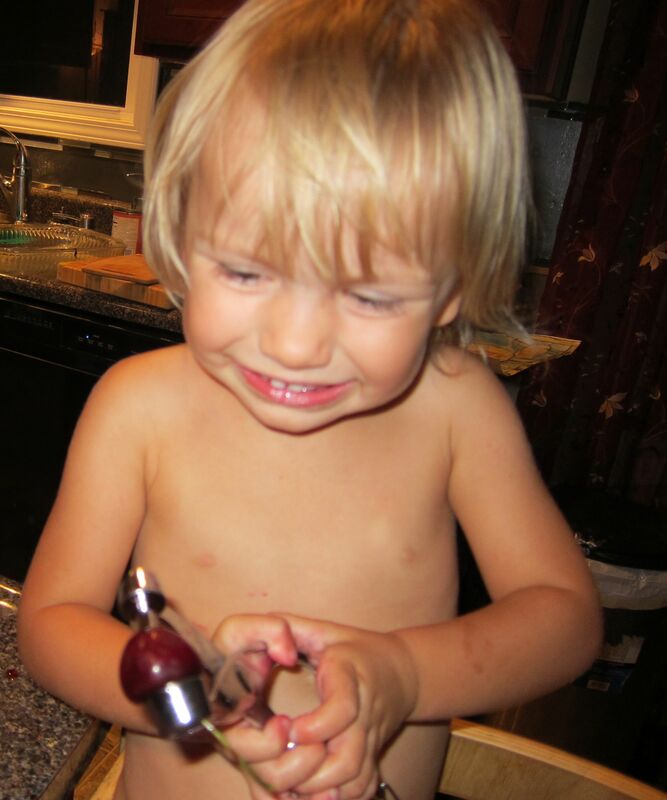 Bug enjoying pitting cherries. 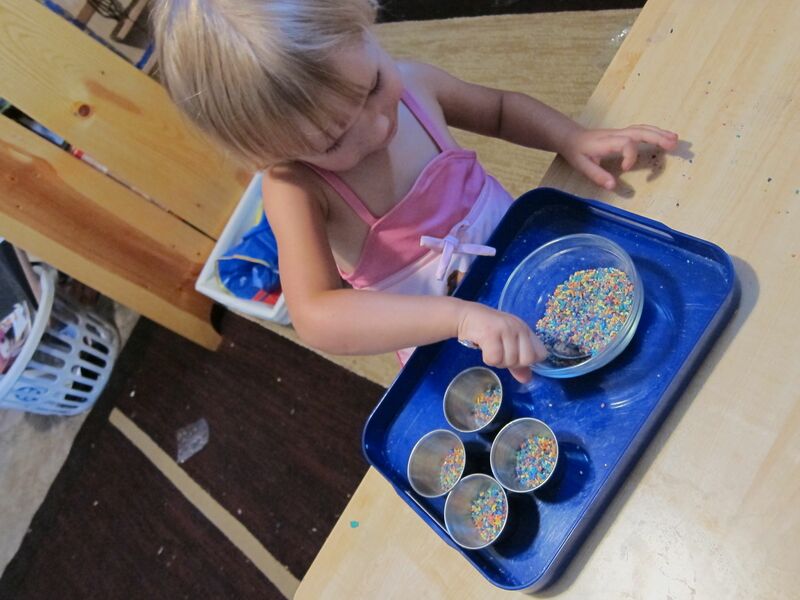 She *loved* how messy this job was! 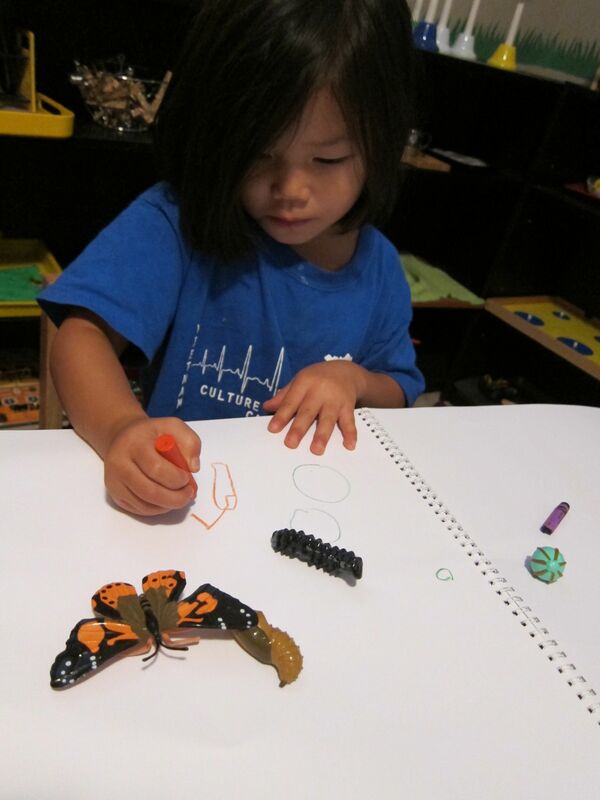 Bug doing dot art for "B is for Butterflies"
The "please touch" table for the next couple weeks (there are also butterflies under glass for them to observe). 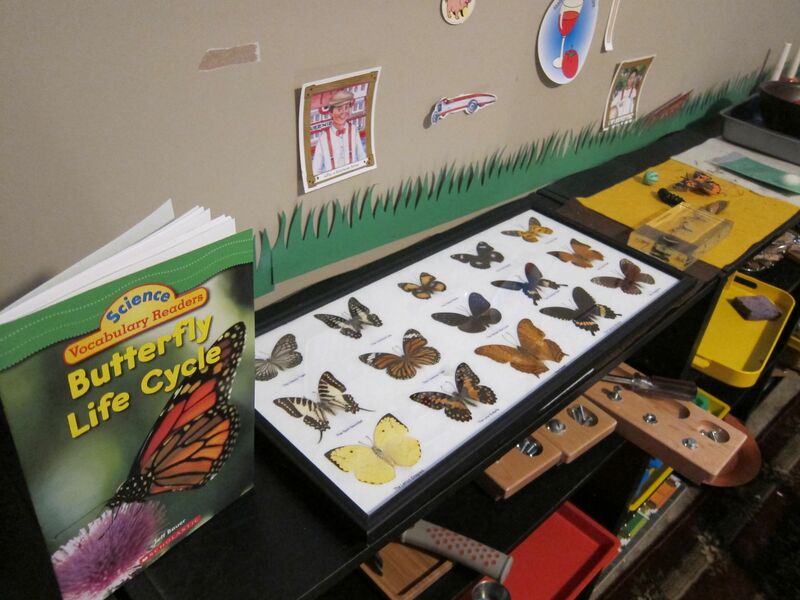 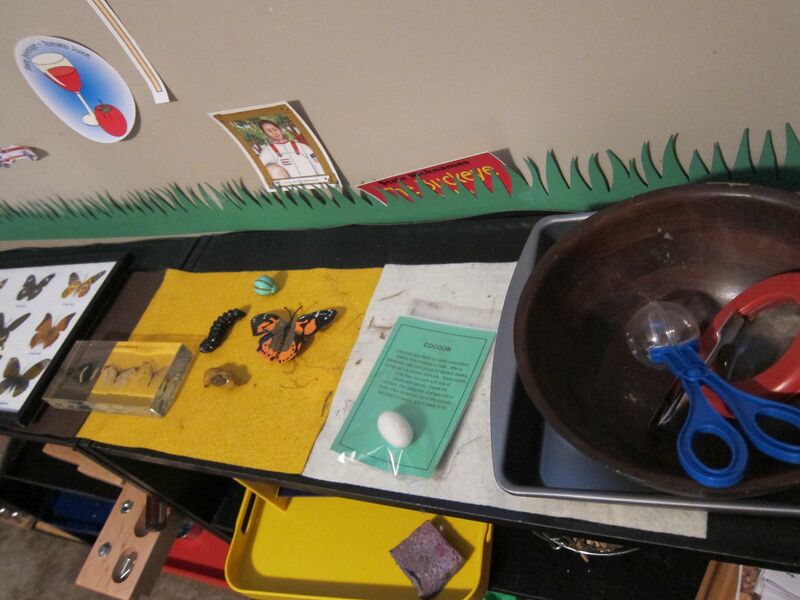 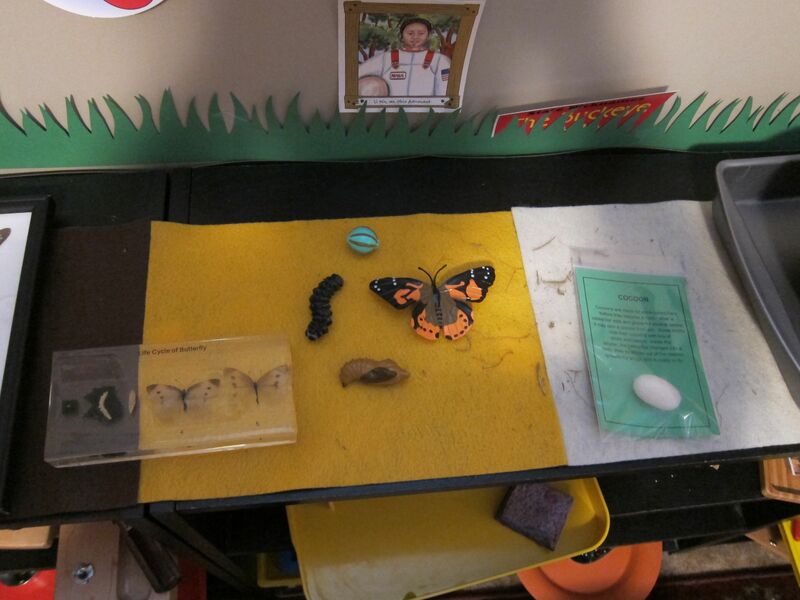 On our main level, we raised some butterflies from caterpillars, so the kids also witnessed the life cycle in person. 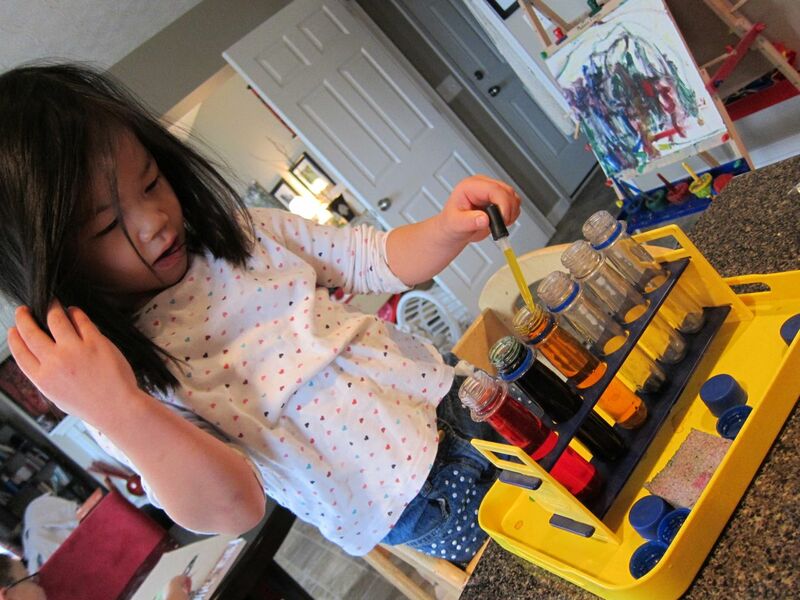 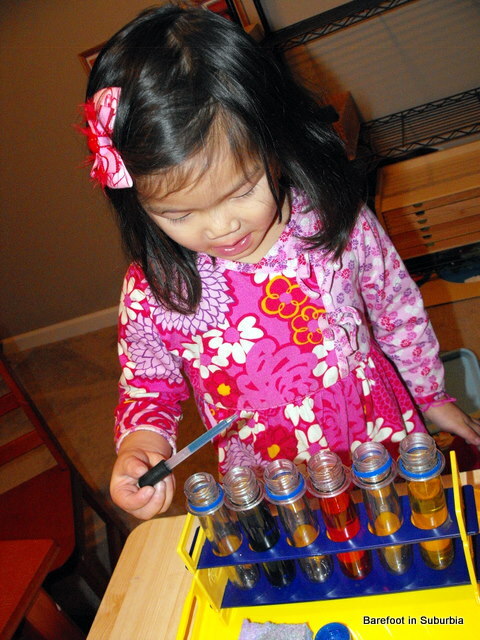 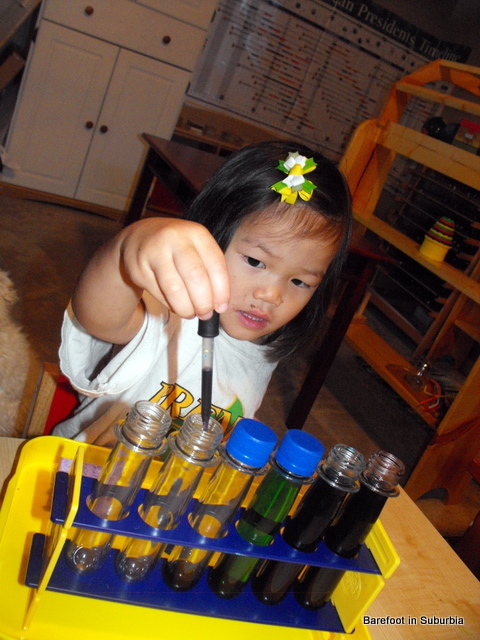 Monkey mixing colors in the test tubes using an eye dropper.